You would think that being on the verge of a bailout by the EU, Spaniards would be just a bit more conservative in their lifestyle and spending. But this just isn’t very apparent from what I’m seeing around me now. Sitting in a café in Plaza Mayor of Spain’s capital, Madrid, the many bars and cafes are as busy as it also has been, with locals and tourists alike sitting on the outside terraces enjoying the lovely 25 degrees summer sunshine, with a glass of wine, beer, or sangria in hand and some tapas casually laid out on their tables. The Spanish lifestyle appeals much to me. The people are beautiful and passionate; Beautiful such that ¾ of the women here are taller than me with model figures, with lashes as long as faux ones, while hosting nice tans and sensual cheeky smiles; Passionate such that I would see at least 10 couples making out in public in the span of a day (with some unabashed gays and lesbians at that). We will probably never get to see such scenes in Singapore much because of the fear of being featured on Stomp, but if Singaporeans can’t have public displays of affection in public nor at home (as almost all youths still stay with their parents), I’d like to think that we are quite a sad bunch. 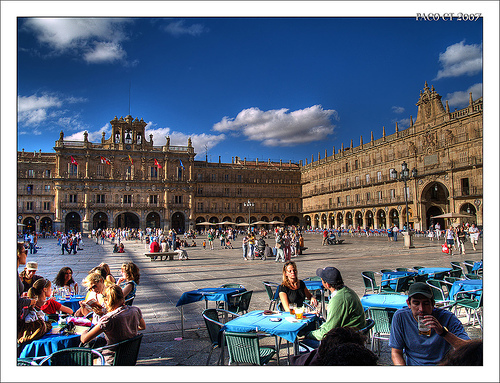 Superficial looks aside, the Spanish dining habits complement my lifestyle well too. 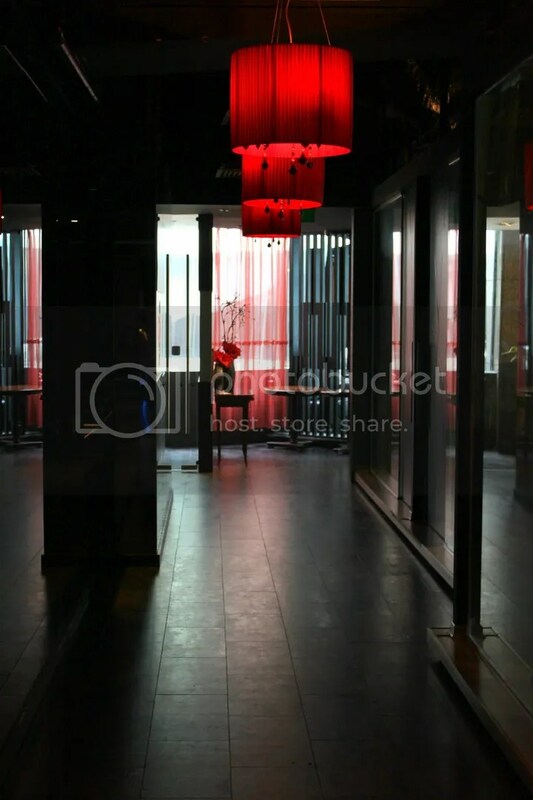 Restaurants typically open for lunch between 1pm to 4pm, and dinner between 8pm to 11pm. And in the day, most shops close for a short break between 3pm-5pm, and we wonder why Spain is defaulting on its debt. Anyhow, almost all restaurants and cafes in Spain offer 3-Course Set Lunches usually priced around 10 Euros (which is a steal given the portion sizes). 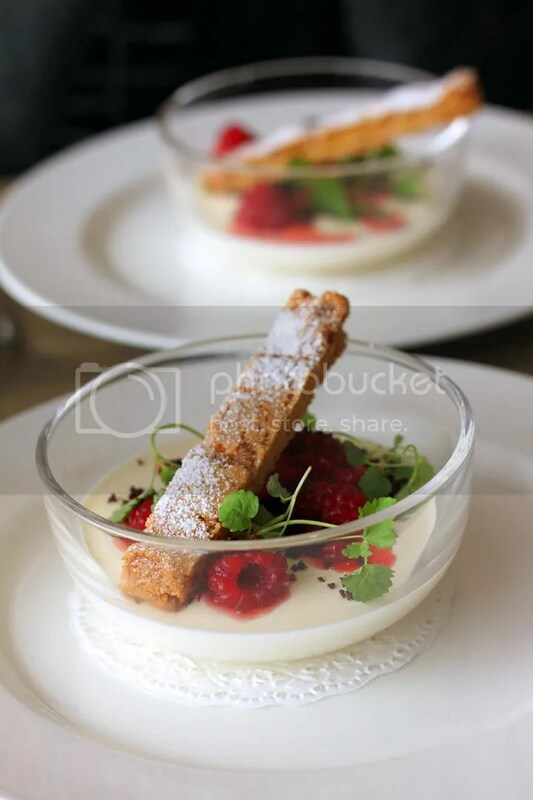 Apart from the Starter (often as large as the Main) and Main, the 3rd course is usually a choice between Dessert (or Postre as it’s known in Spanish) or coffee. It’s also common knowledge here that a drink is included within the Set Lunch, with a choice of mineral water, a glass of wine, a mug of beer, a soft drink or a glass of sangria. Hence, I find dining most affordable here. And since portions are so ginormous, I think most people can get by by sharing 3 set meals between 4 people. 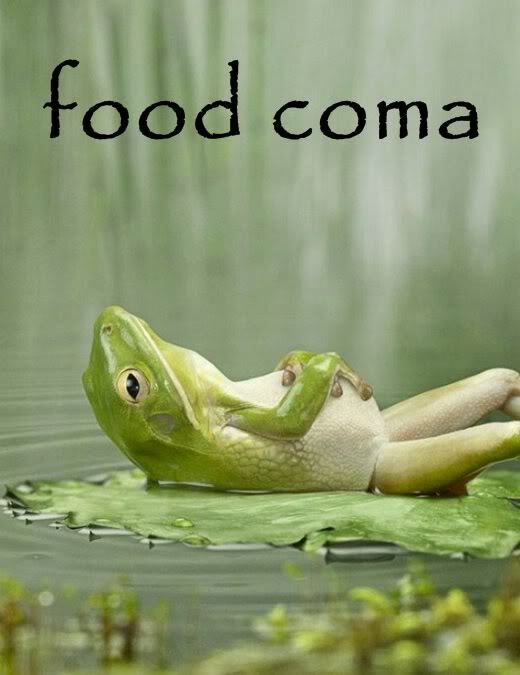 So far, I have been trying my best to finish set lunches by myself, which has led me to slip into food comas for 3 days in a row now, where I have had to head back to the hotel around 4pm to sleep off the meal before waking up for dinner again. 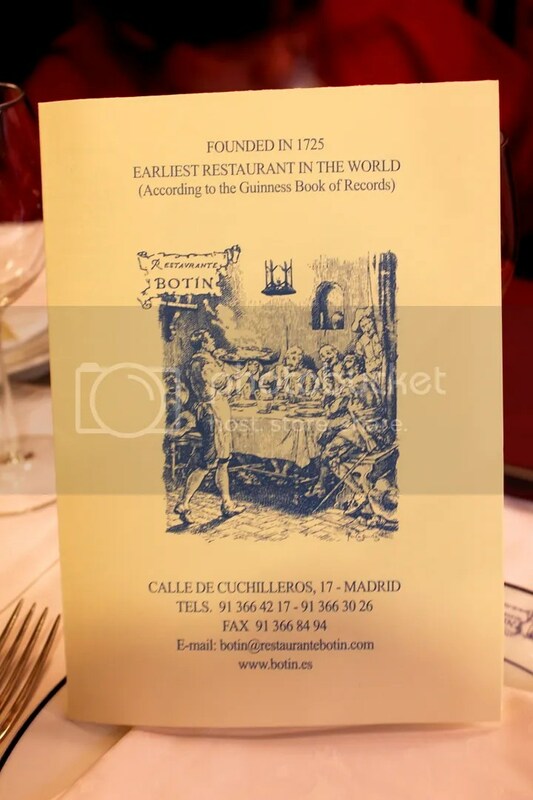 One of the highlights of the Madrid leg of my Eurotrip is definitely dinner at Botin, which based on the Guinness Book of Records, is the oldest restaurant in the world today at almost 300 years of age. 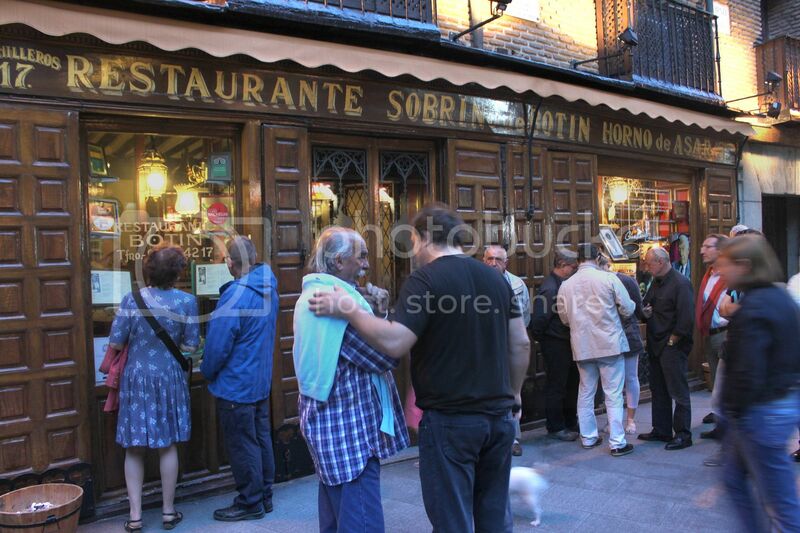 Included in almost every Madrid guidebook, Botin is the place to go for an authentic Spanish traditional dish; Roast Suckling Pig. Roasted in a traditional wood-fire oven, a whole supple young piglet is then cut up and serves 2 and a half portions. 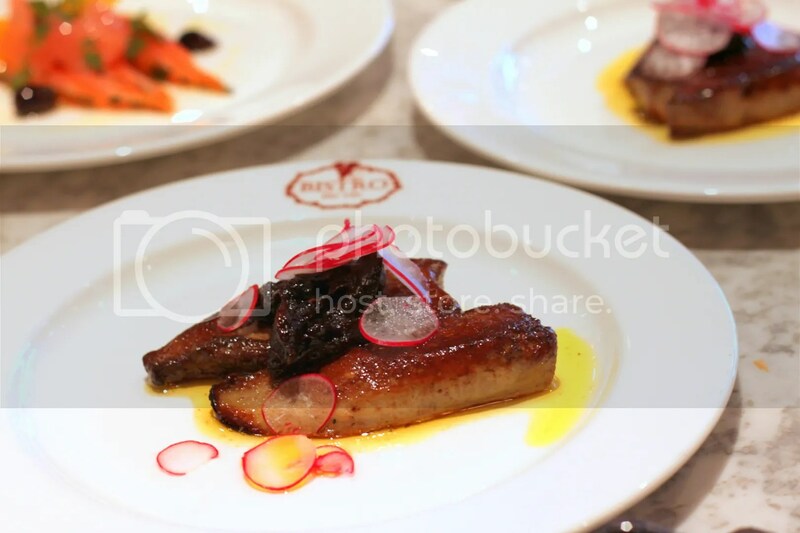 So if you are a fan of suckling pig during wedding dinners, or have been to the highly raved about Ibu Oka in Ubud, Bali for their Babi Guling aka Roast Suckling Pig, do head down to Botin and savour what the best really is like. Though it opens at 8pm for dinner, there were already at least 50 people queuing outside at 7.45pm, most of whom had made reservations. While my family didn’t make any prior to coming, we decided to still give it a shot and prayed that some group had decided to ditch their reservations last minute. Miraculously, from what I witnessed, everyone else without reservations was turned away at the door (even a couple ahead of us) but somehow my family managed to get seats. Perhaps there really was a cancellation for a 5 pax reservation! 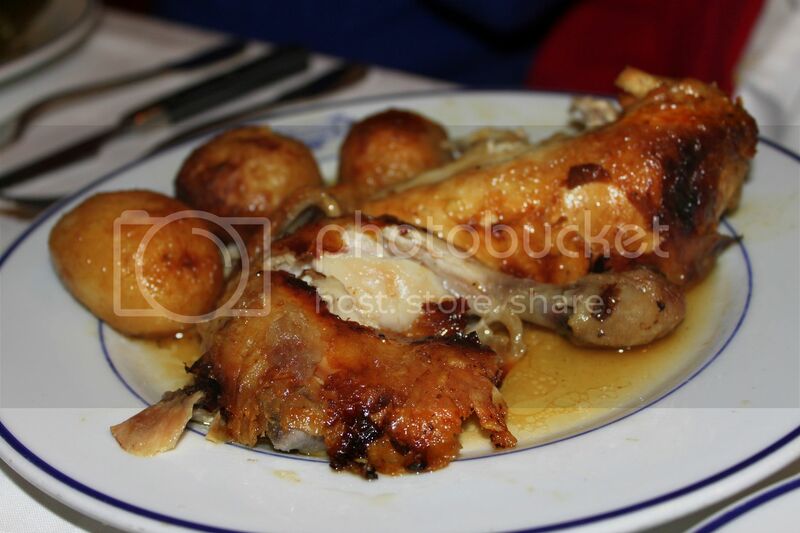 While the highlight is on the Roast Suckling Pig, Botin does a decent job with their Roast Chickens too, where the meat is kept succulent and juicy while the skin is really crisp. For those with a huge problem with excessive sodium, they can easily settle for the Baked Sole, which is also rather fresh and tasty. 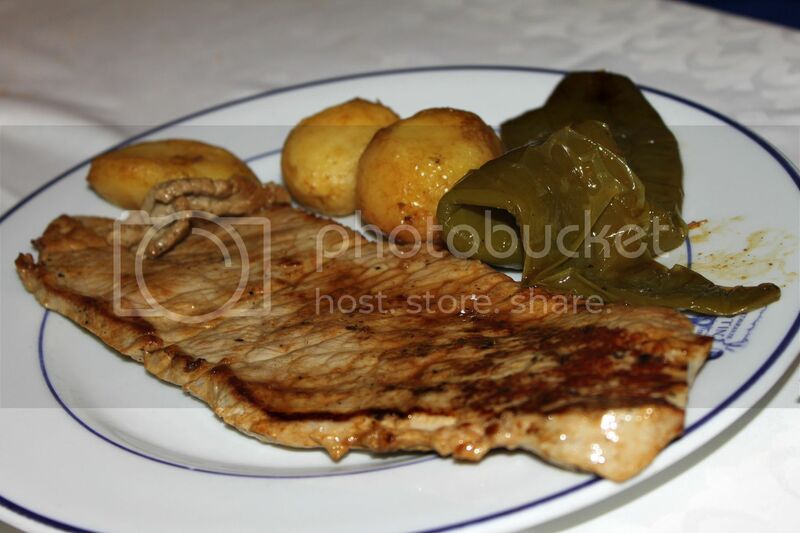 What I would suggest avoiding however, would be the Grilled Veal. It is cooked simply and thus tastes as such. They don’t even bother asking you how well you want it done, so I’m guessing well done is the default. 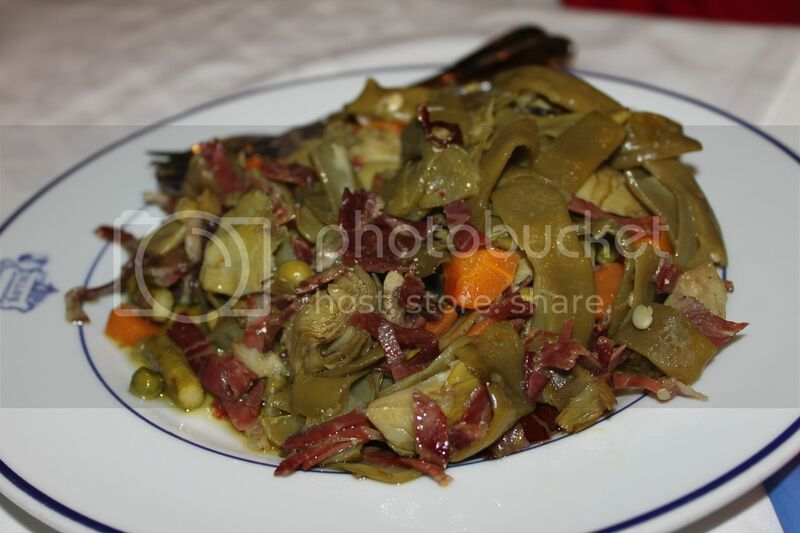 It wasn’t my idea to order Assorted Vegetables with Iberian Ham. It costs about half as much as a meat main, and is doused with lots of oil. Coupled with the salt from the Iberian ham, I think this really isn’t worth the future hypertension and stroke. Death by suckling pig seems more appealing than death by assorted vegetables, don’t you think? 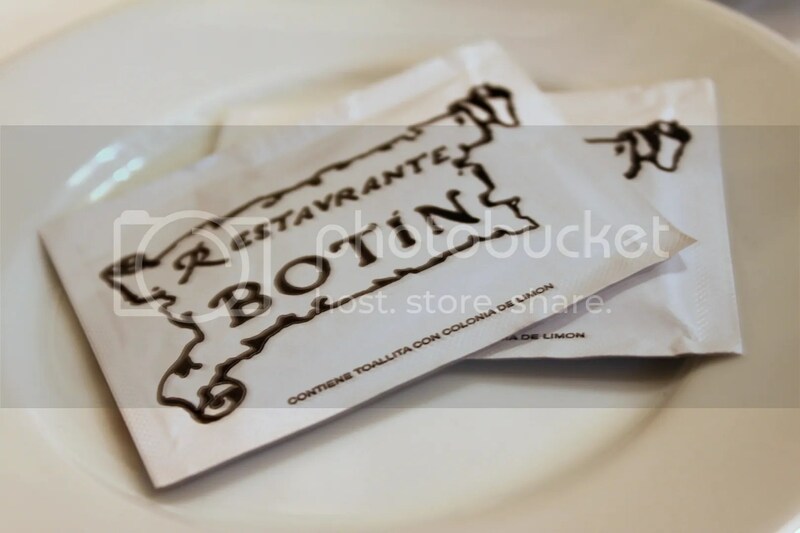 I visited Botin again for lunch alone 2 days later for their Roast Lamb; the other of their signature dishes I had missed that night. And it was so tender and crisp, devoid of any gamey taste that I initially mistook it for the Suckling Pig! However, I still preferred the subtly more cripsy crackling of the piglet compared to the lamb. 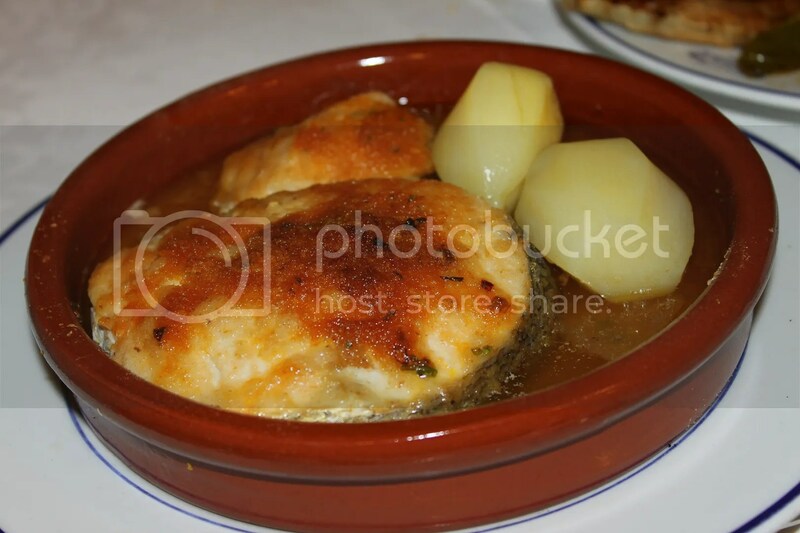 Categories : All YumYums in my TumTum, Cuisine Type YumYums, Location of YumYum, Overseas, Spain - Madrid, Spanish, Yummy! 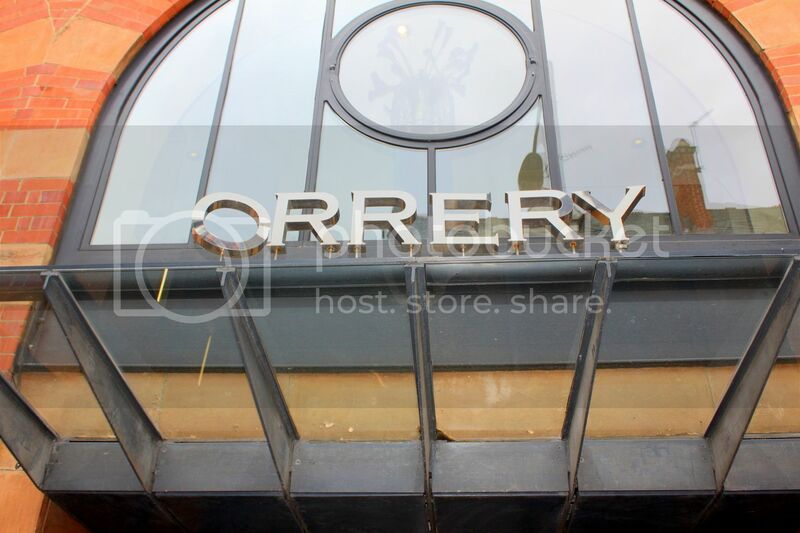 Everytime my brother has friends fly over to visit him in London, he never fails to bring them to Orrery, an ex-Michelin star French Restaurant. 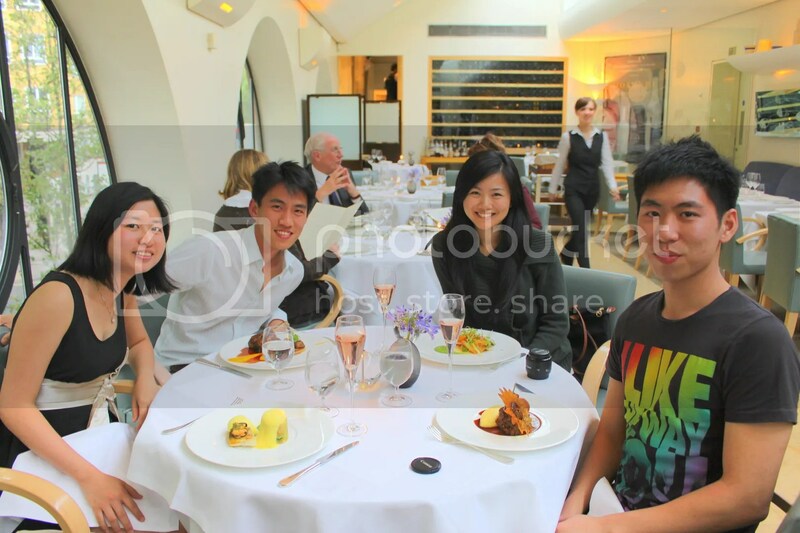 Similarly during my visit, he made a booking for one of their 3-Course Set Dinners via Toptable, priced at 28.50GBP. We were first treated to a glass of Grand Cru, a type of French Wine. I’m a noob when it comes to wine and don’t know the difference between prosecco, sparkling wine or champagne. Well, I’m sure many that many of us are in similar predicaments so I shall quickly list out the main differences based on my inference of what all-knowing Google says. 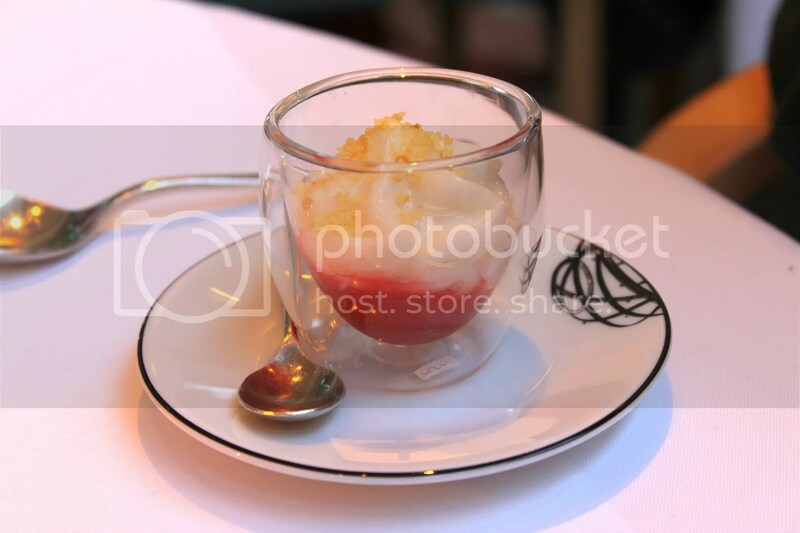 According to my brother, Orrery always serves a complimentary starter and pre-dessert. 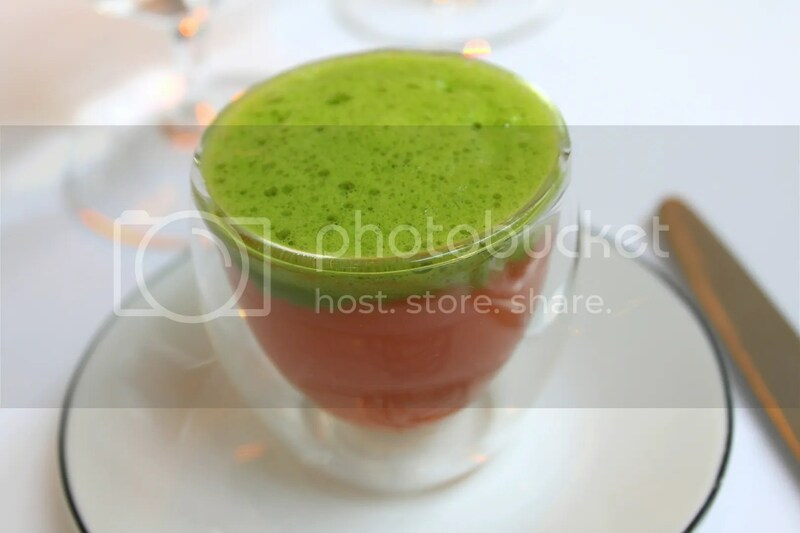 The hors d’oeuvres today was Tomato soup topped with Basil foam which I felt lacked synergy and was too tangy for my liking. Regardless, it was free. 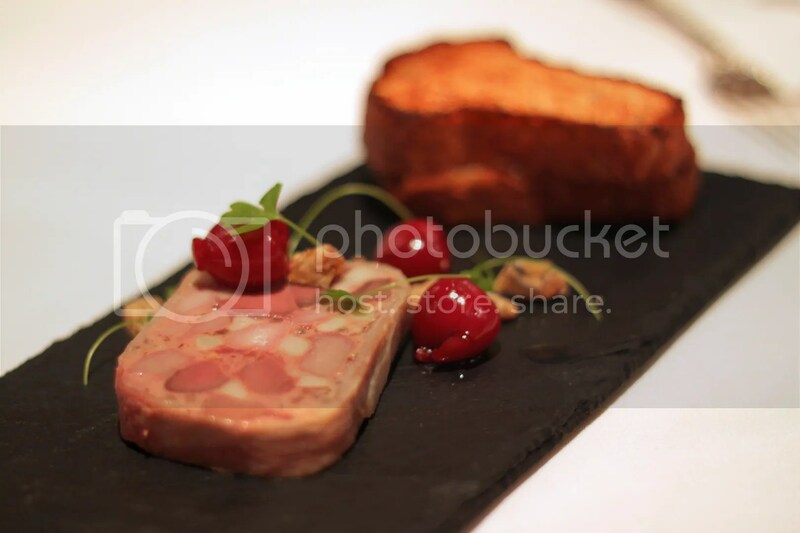 Usually I prefer my foie gras unadulterated, pan-seared and lightly seasoned but a few recent encounters with its terrine/pate versions have left me thinking. 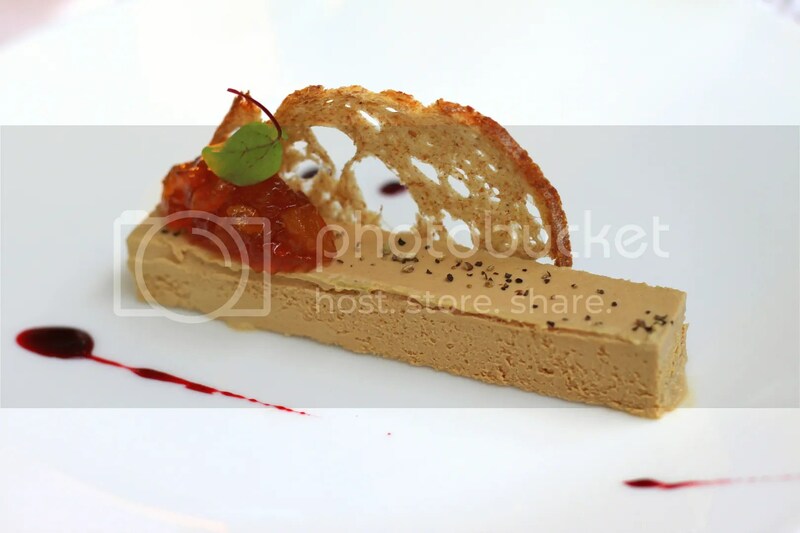 Easily the best dish of the night, the Foie Gras Parfait here trumps over the one I had at Novus, with the caramelized apples doing well to contrast against the smooth appetizing parfait. 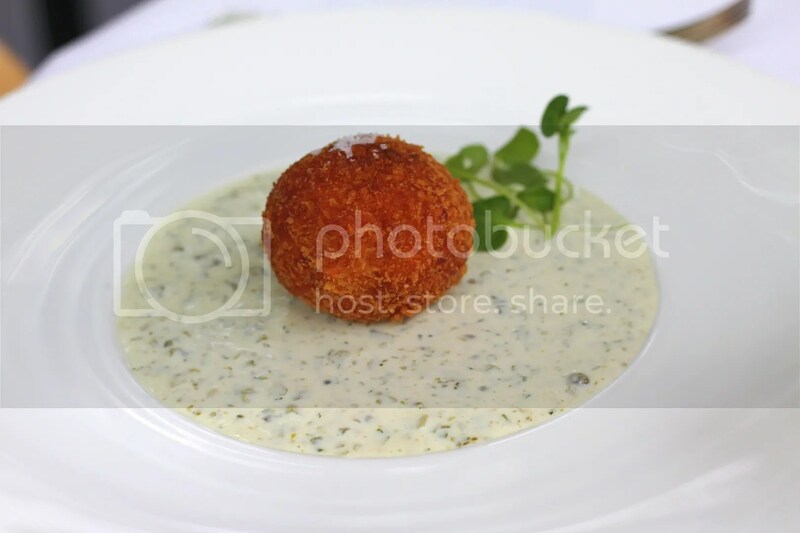 The Orrery Fish Cake with Tatare Sauce was a simple Fried Salmon Ball. 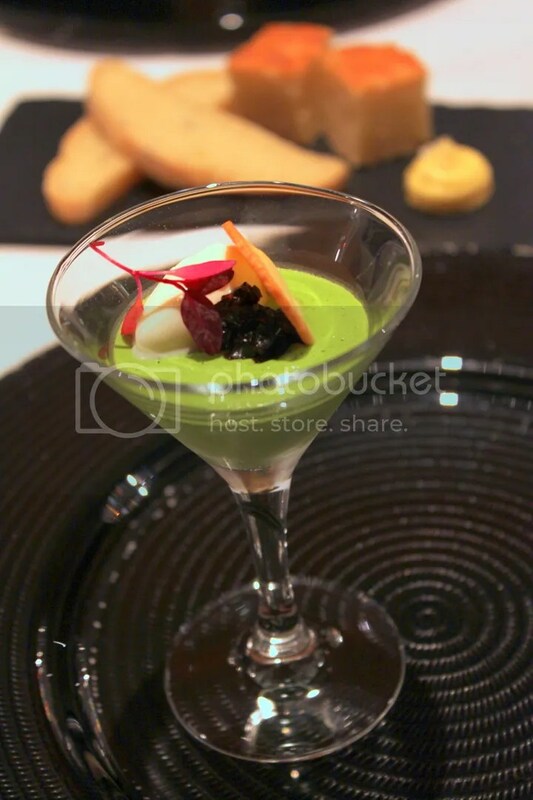 It tastes fine but I was expecting something a little more sophisticated and elegant given the restaurant. 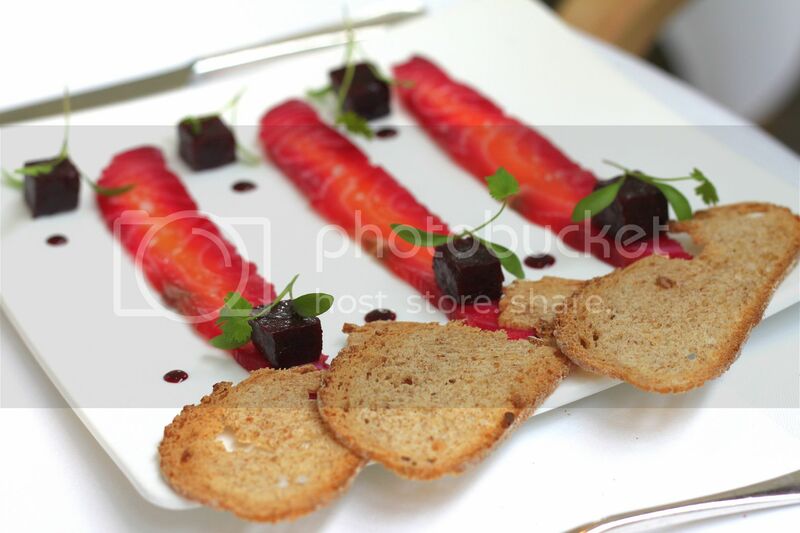 The Salmon Gravadlax with Beetroot & Coriander is something I’d normally avoid due to its simplicity in preparation but then again, it’s also something that hardly ever goes terribly wrong. For my main, I ordered the Braised Shoulder of Lamb a la Bordelaise with Mashed Potatoes. By the mere fact that I can’t recall much of it ever since eating it last week, I dare say its forgettable, literally. 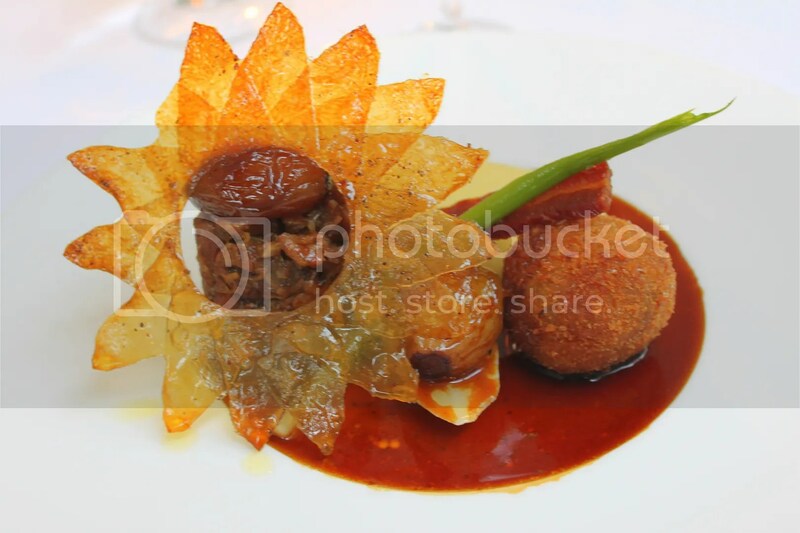 Given that Orrery specializes in French cuisine, I was quite surprised that a traditional French dish; Confit Duck Facon Grand Mere, Jus Gras, turned out rather soggy. 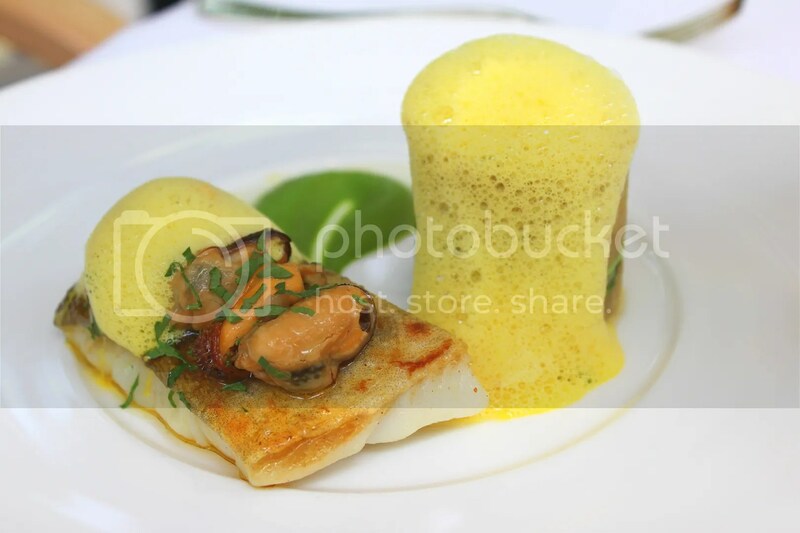 Even the safest of choices, the Cod Fillet with Potato Cresse & Mussel Veloute was underwhelming and rather petite in size. The Roasted Sea Bass with Barigoule, Coriander & Citrus was probably the only decent main that evening, with some decent crackling of the fish skin. 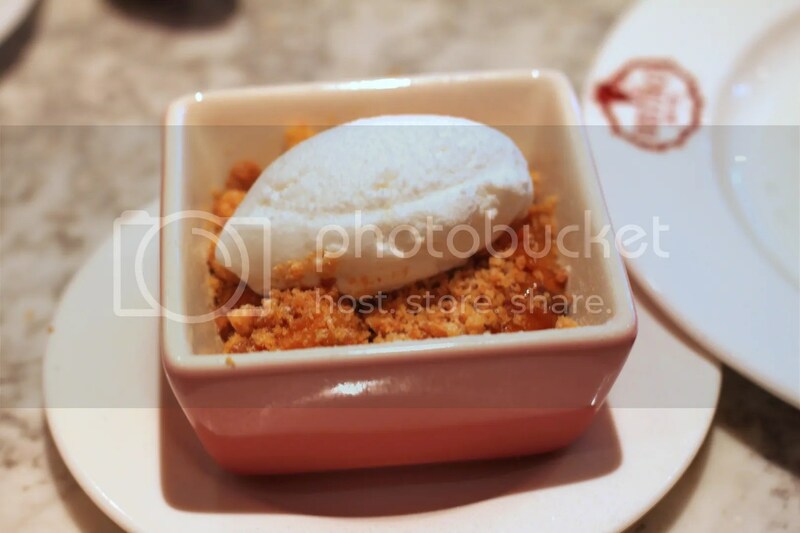 For our complimentary pre-dessert, we were each given Rhubarb topped with Lemon Sorbet and Crumble. For Dessert, most of us sticked to the popular Chocolate Fondant with Blood Orange Sorbet. I tried to capture a pic exhibiting the choc lava flow but given that the molten chocolate was far too little and way too dense, such a feat was impossible. We did enjoy the sorbet though it’s probably the fastest melting sorbet I have seen. The Apple Crumble with Vanilla Ice Cream too fell short of expectations. Its saving grace was really the Ice Cream with its evident fragrant black specks of vanilla beans. 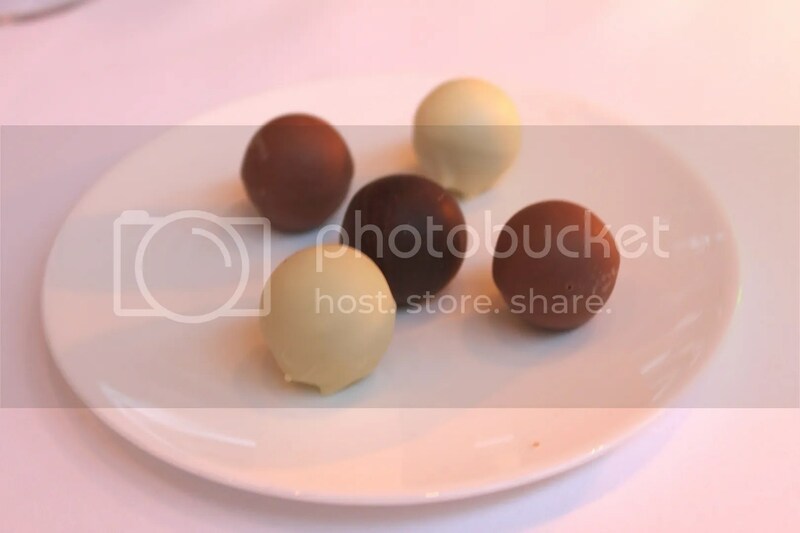 Complimentary chocolates to end off the meal. 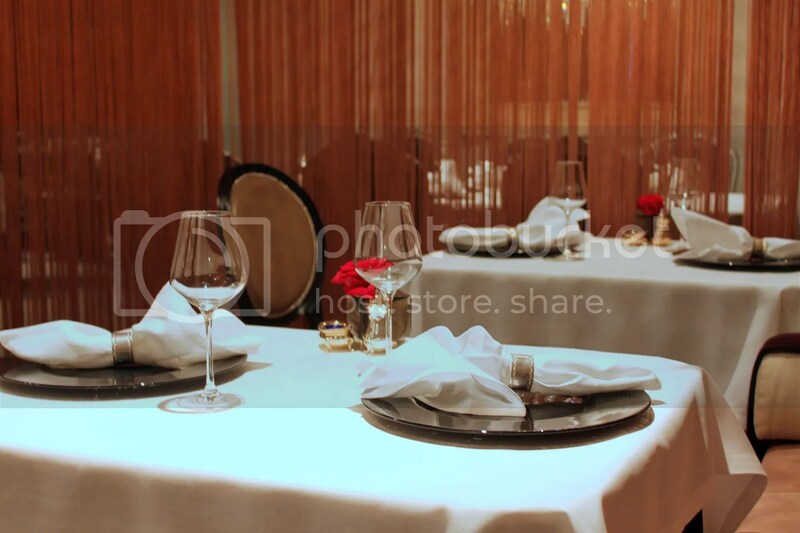 While service and ambience are worthy of Michelin-class, I’m guessing Orrery was probably dropped from the “star-studded” list due to inconsistency in their food. 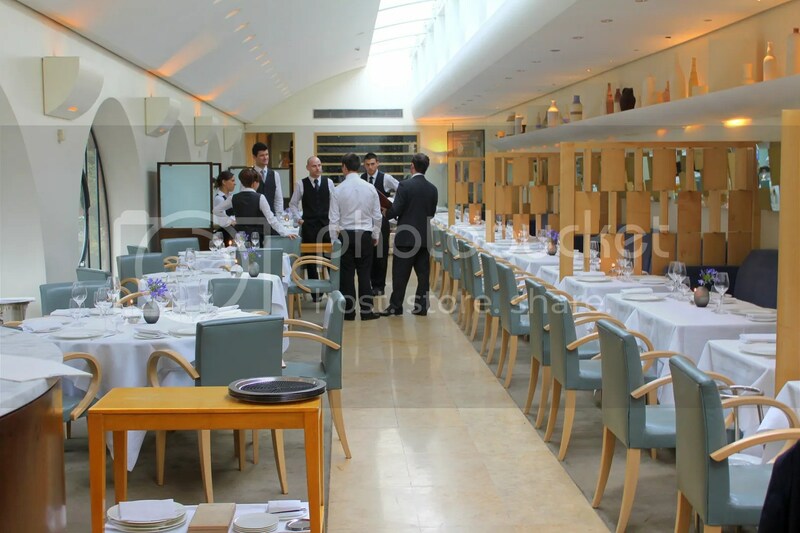 I was quite pleased with myself when I managed to secure an online booking for lunch at Rhodes W1, especially when it was a 5-Course Spring Tasting Menu at just 25.50GBP. I can’t remember which website I used to make the reservation but I discovered that one of the more dominant reservations sites within the UK would be Toptable. 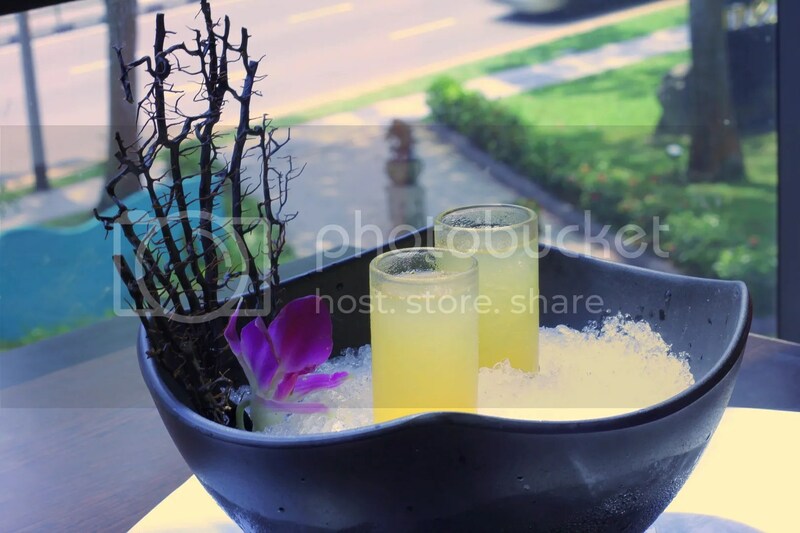 It’s a restaruant booking website (very much like diningcity) which frequently offers diners specially priced set menus, and 50% off restaurant bill deals for diners who choose to make their reservations via toptable for selected restaurants. Why doesn’t Singapore have such a website?! 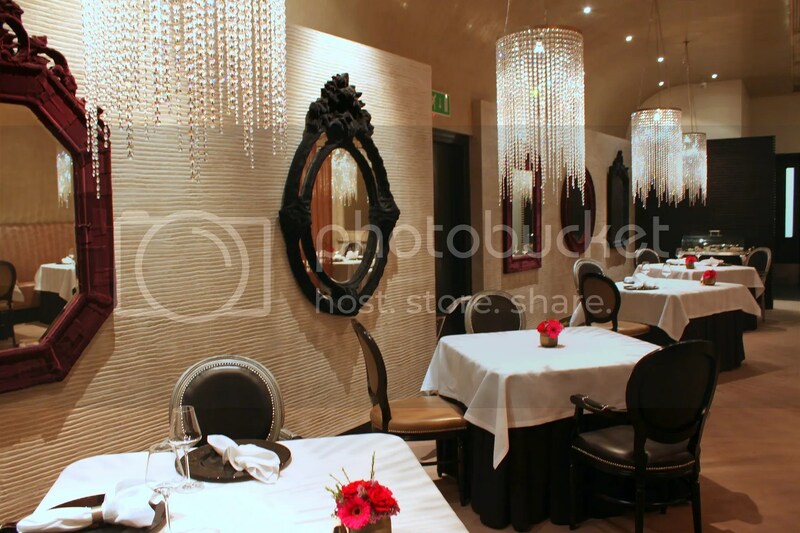 Awarded 1 Michelin star, Rhodes W1 came across to me as being excessively posh, with a chandelier overhanging each and every table and Molten Brown liquid soap & hand lotion and nicely folded cloth towels in the toilet! (and yes, in case you are wondering, I did what normal kiasu Singaporeans would do and spammed some hand lotion before leaving). Despite being labelled a contemporary French eatery, I believe that much of what Rhodes W1 conjures up derive influences from an eclectic mix of different cuisines. I’m more of a focaccia person that a ciabatta. Courgette (Zucchini) Mousse, Goat Cheese Ice Cream with Balsamic Jelly. 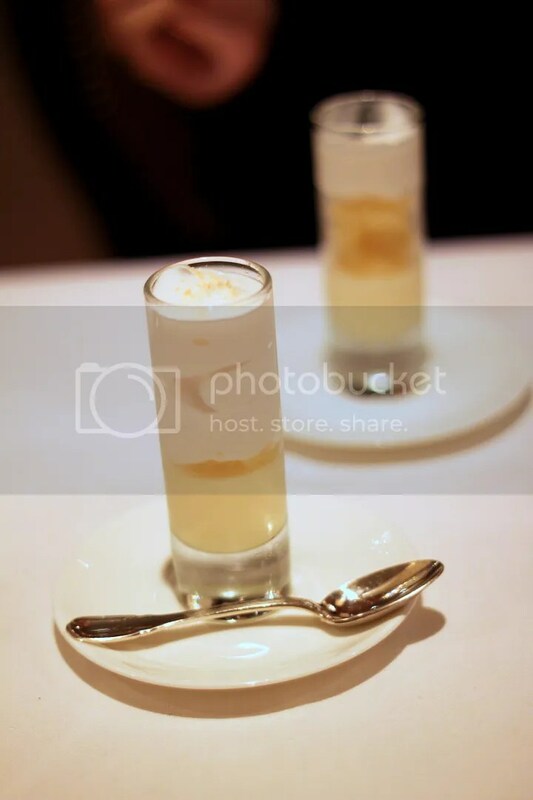 I liked how the palate cleansing balsamic blended well with the creamy mousse. 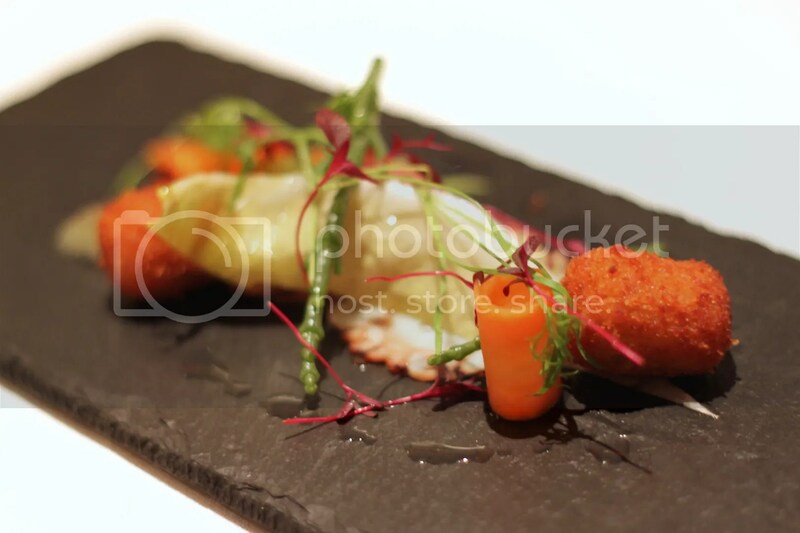 Braised Octopus Carpaccio, Chorizo Croquette, Fennel and Lemon. Nothing mind-blowing about the octopus but I did like the Croquette which was well fried though I couldn’t really discern the taste of chorizo from the potato. As G doesn’t take Octopus, the chef obligingly replaced it with a Pigeon Pate, which ironically I found more tasty and substantial. 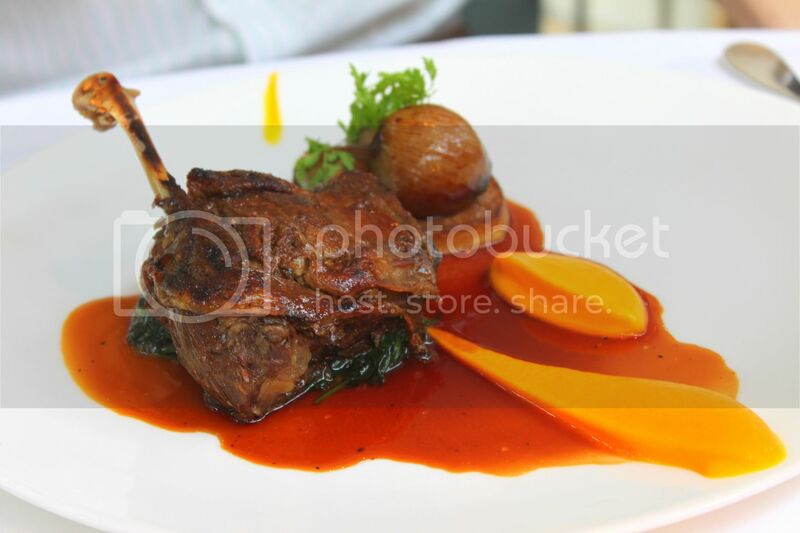 I just had a Guinea Fowl Confit at Bistro Du Vinlast week which wasn’t exactly spectacular and concluded that Guinea Fowl is just a lesser poultry, short on taste and texture compared to duck or chicken. However I was proved wrong after tasting the Slowed Cooked Guinea Fowl, Baby Leeks, St George’s Mushrooms & Foie Gras Emulsion today. The cylindrical pieces of meat came from the breast and was stuffed with what I gathered was egg, sunflower seeds and some other ingredients. 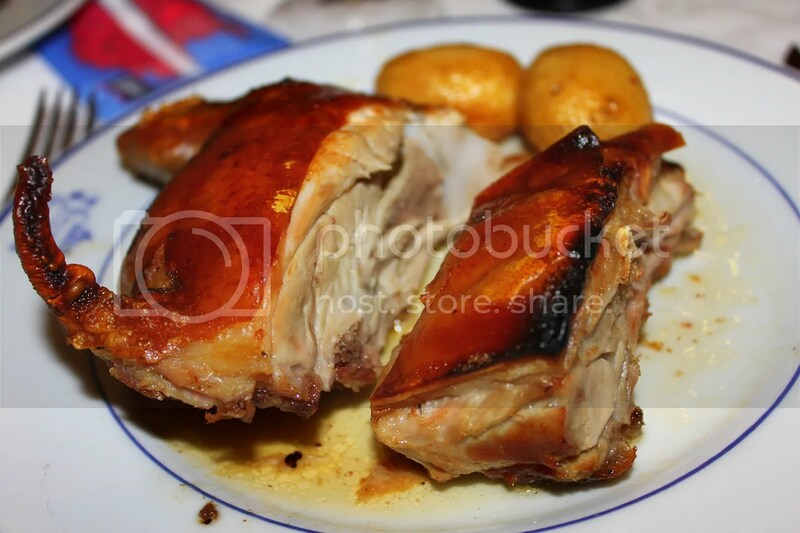 As for the rectangular piece, it consisted of the thigh portions. Both were succulent and juicy. Pina Colada. Coconut mousse atop pineapple sorbet. Carrot Cake Cream Cheese Ice Cream. A sweet ending to the stellar meal. The bill arrived in an envelope labelled “The Damage”. Very cutesey…I like. I would think that more people would associate Michelin with being a restaurant appraiser rather than a tyre company. As history has it, the Michelin guide sprung forth as a guide to help drivers maintain their vehicles in addition to suggesting decent lodging and restaurants in France. Over the years, such Michelin guides have also been published for other major cities around the world, though sadly Singapore is not one of them. 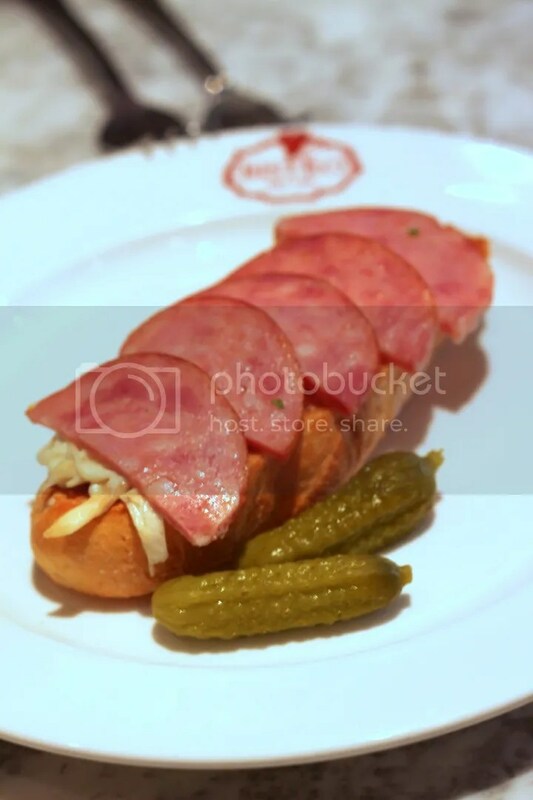 That is the reason why we don’t hear of Michelin star restaurants in Singapore and not because Singapore restaurants are not good enough as one might possibly think. 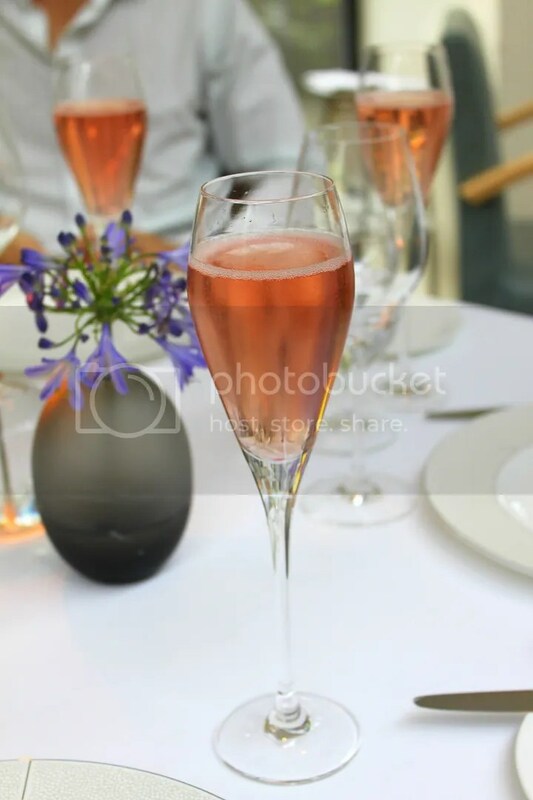 As at 1st February 2010, London has 2 Michelin 3-star restaurants, 7 2-star restaurants and 40 1-star restaurants, a large proportion of which serves French cuisine. 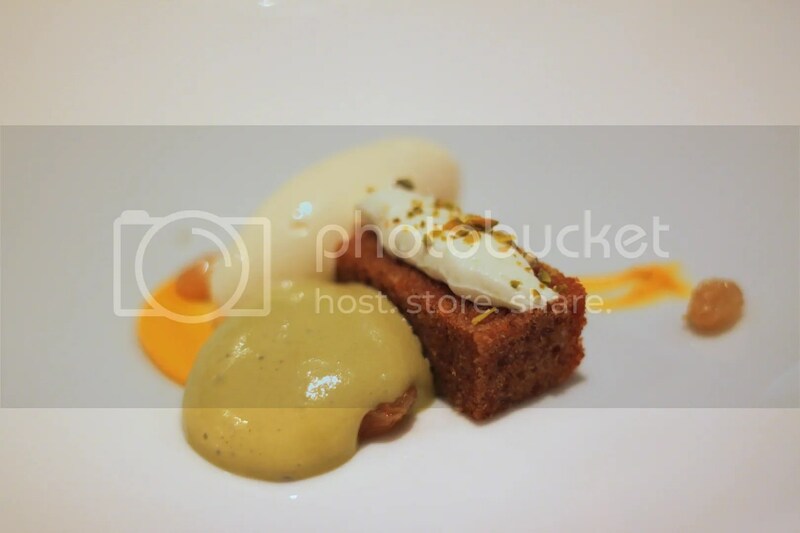 As this was my first time trying out a Michelin starred restaurant, I was particularly excited. 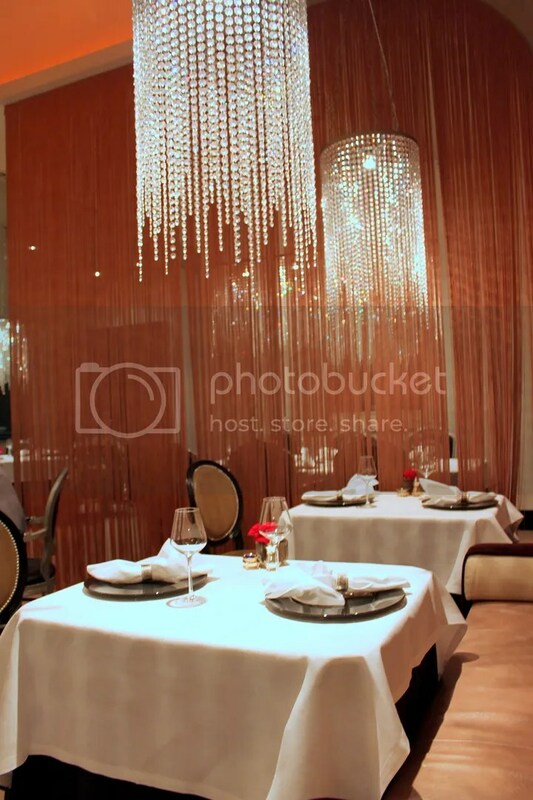 Arbutus is a 1-star Michelin restaurant serving contemporary European cuisine. 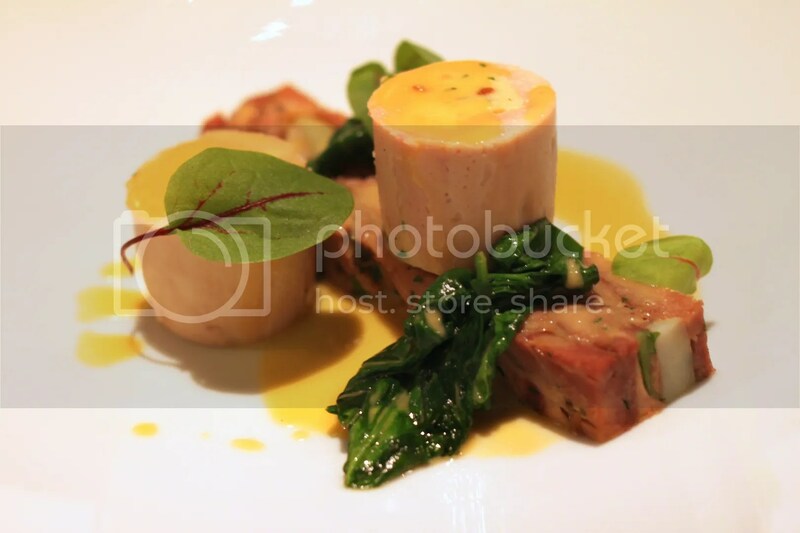 As far as I know, it’s also probably offers the most affordable 3-course set lunch amongst its London Michelin starred counterparts going at just 16.95GBP. 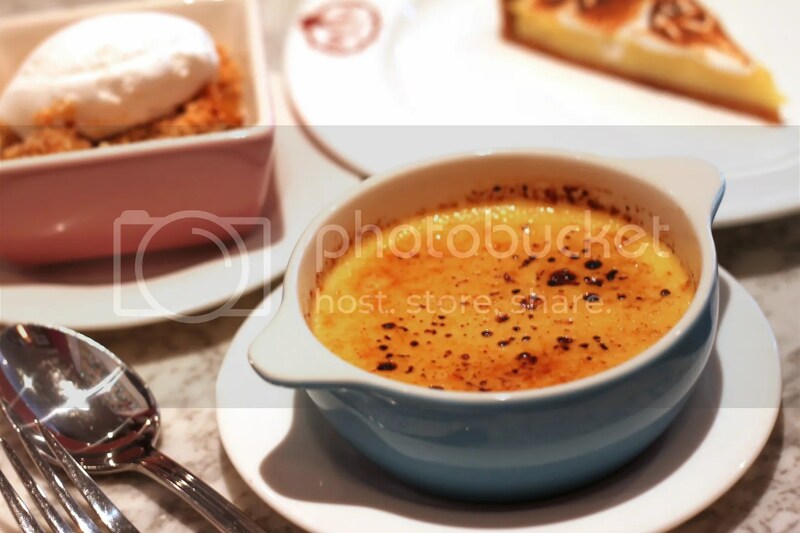 Located in Soho, which is pretty much central London, it gets really packed during lunch so reservations are a must. 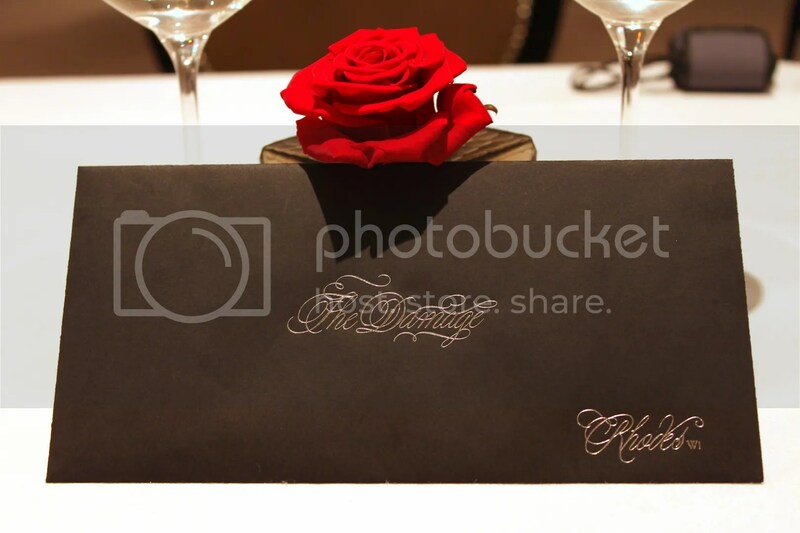 For the set lunch menu, diners are only given a choice between 2 items, for each of the courses. 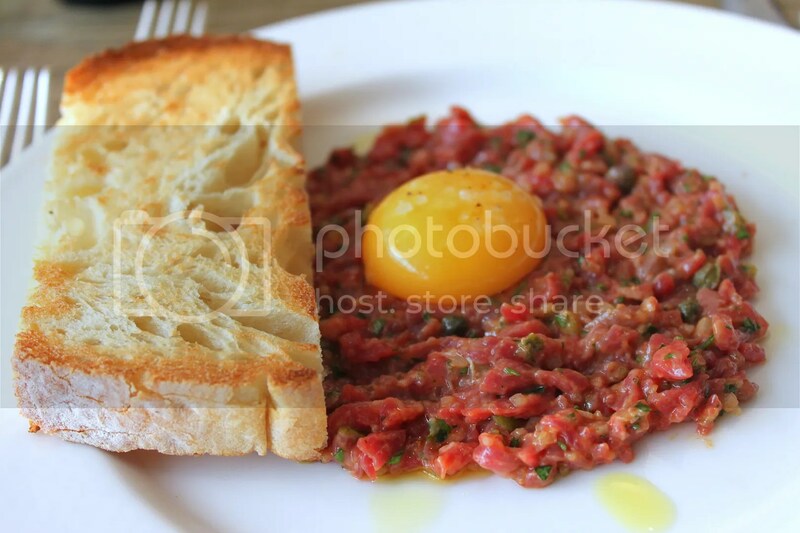 Both G and myself had the Hand Chopped Scottish Beef Tartare and given its rarity in Singapore restaurants, this is possibly my first or second time having it. The green spices dotting the beef are capers, which are the green stuff you see in tartare sauce. It has a slightly briny pickled taste to it and helps to musk any odours of the raw beef, though there was none in this case. Another uncommon item on Singapore menus, I took a strong fancy to the Slow Roast Rabbit, Aubergine (aka eggplant), Potato Gnocchi. 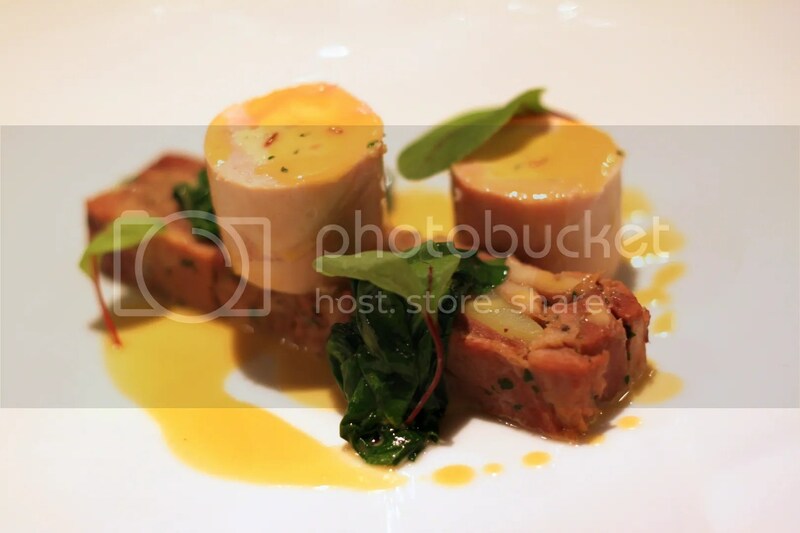 The rabbit was served already debone which I’m very thankful for as it can get quite troublesome deboning it yourself. While it tastes much like chicken, I much prefer rabbit as it is typically more tender and flavourful when executed well, which in this case it was. For Desserts, we both had the Vanilla Panna Cotta. It was very smooth and the black specks of fragrant vanilla beans were evident at the base of the glass bowl. 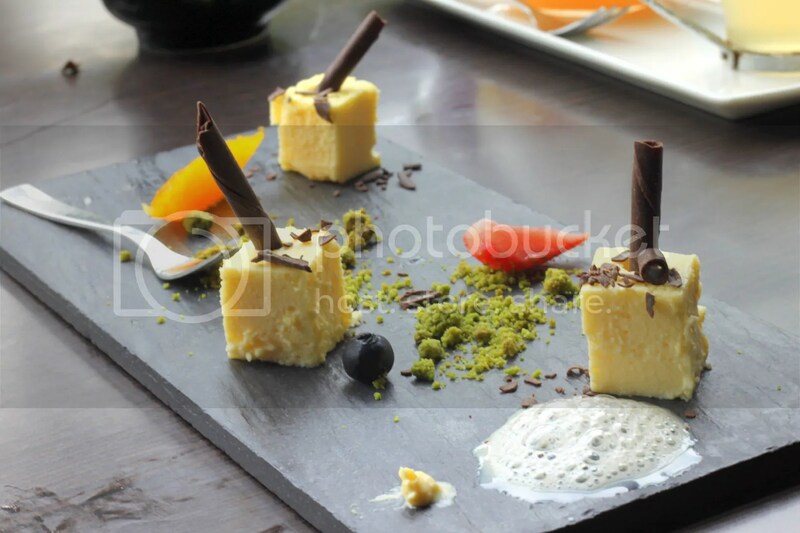 However, personally I felt that this panna cotta was a little too mild and could afford to be made more richly. 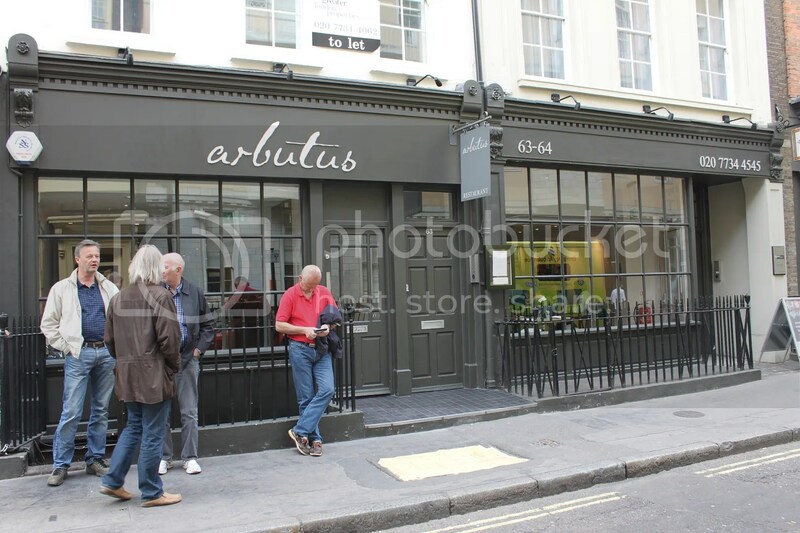 Overall, I felt that Arbutus’s Michelin star is well deserved and one thing I really like about them is that they do not scrimp on the quantity nor quality, even for mere a set lunch. People normally stare at me in disbelief when I tell them I like the SMU culture. In their minds, the SMU culture comprises of a ridiculously competitive and cut throat community of backstabbers and bootlickers vying for that elusive A+. But to me, I perceive the SMU culture very much differently; it’s one where curriculum time is kept at a bare minimum (averaging 13.5-15 hours/week), leaving students free to explore other avenues of self-development. Even our summer holidays are the longest among the local universities. For this year’s summer hols, I have been bestowed 17 weeks! And of course, I haven’t be wasting this precious time, except for the 1st week of hols which I wasted getting wasted. For the remainder though, my itinerary is well planned out. 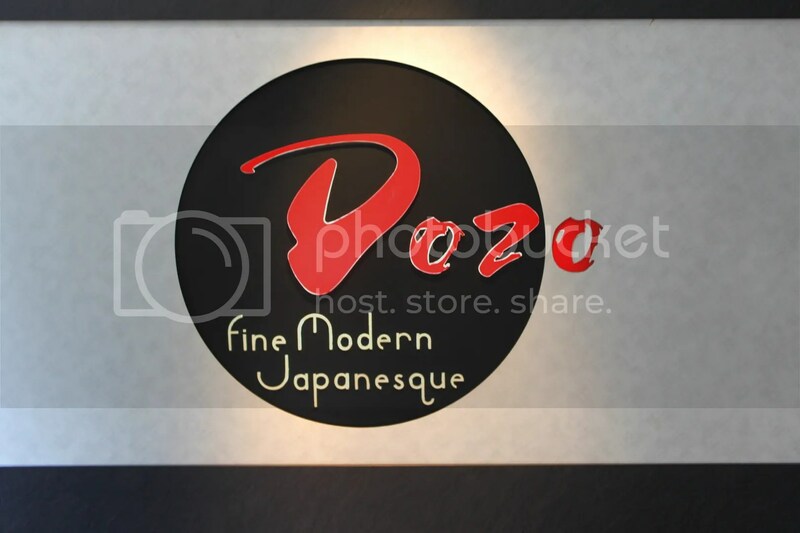 I have visited Dozo and its 2 other sister restaurants Tao’s Restaurant and Ju Ju Hokkaido Hot Pot on multiple occasions and so far, I have not yet been disappointed. 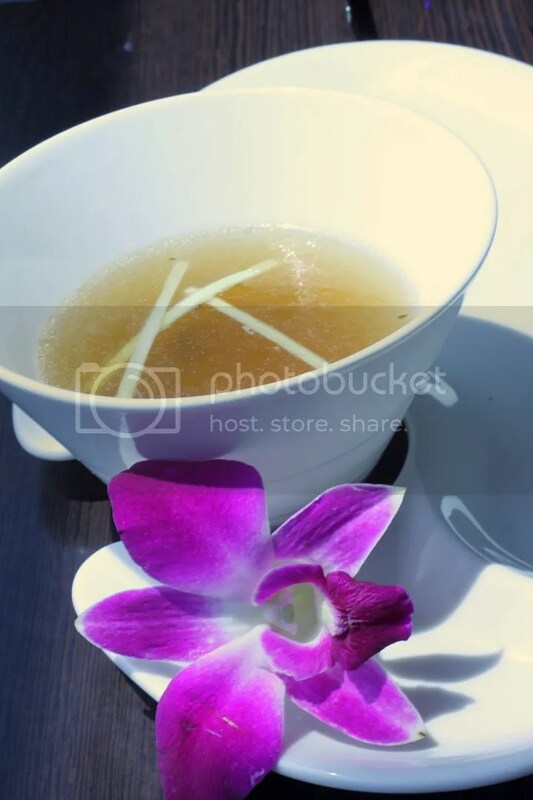 With a 6-Course Set Lunch serving Japanese Fusion priced at $39.80++, I find it pretty affordable considering that 3-course set lunches at most fine dining establishments are around that price range too. The seating arrangements here are really spacious, with tables being set rather far apart from each other, and there are quite a few private rooms available too for larger groups. 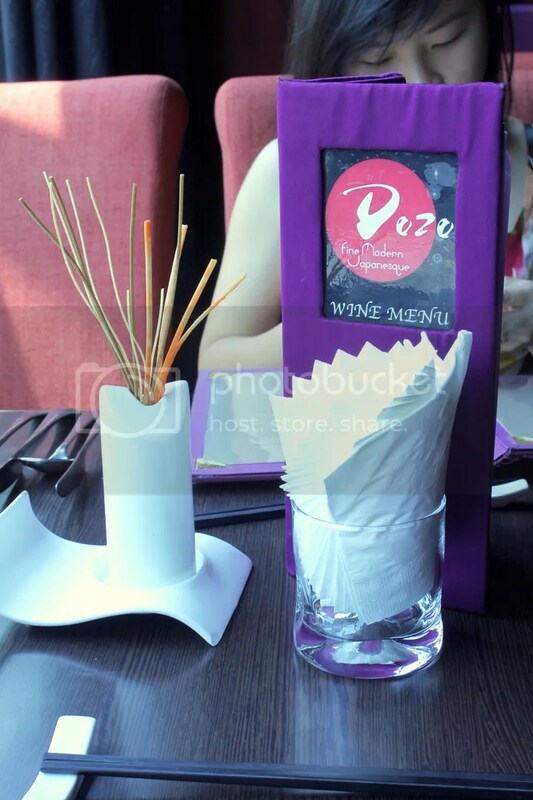 It’s definitely a great place to bring your special someone out for a nice long meal. There’s 3 different flavours of Bread Sticks for diners to munch on before the appetizers are served. The pre-meal Yuzu Sorbet is a common feature among Dozo and its 2 other sister restaurants. This citrus drink promises to stimulate your tastebuds and aid digestion. 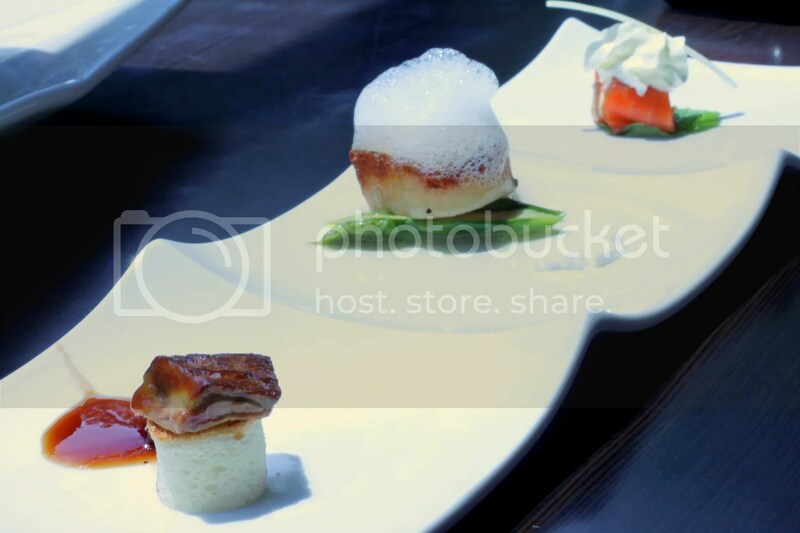 The Chef Selection of Assorted Platter (Seared Scallop, Foie Gras, Smoke Salmon) is really the holy trinity of appetizers. While you will be able to find better renditions elsewhere at their individual level, but the variety is indeed commendable. 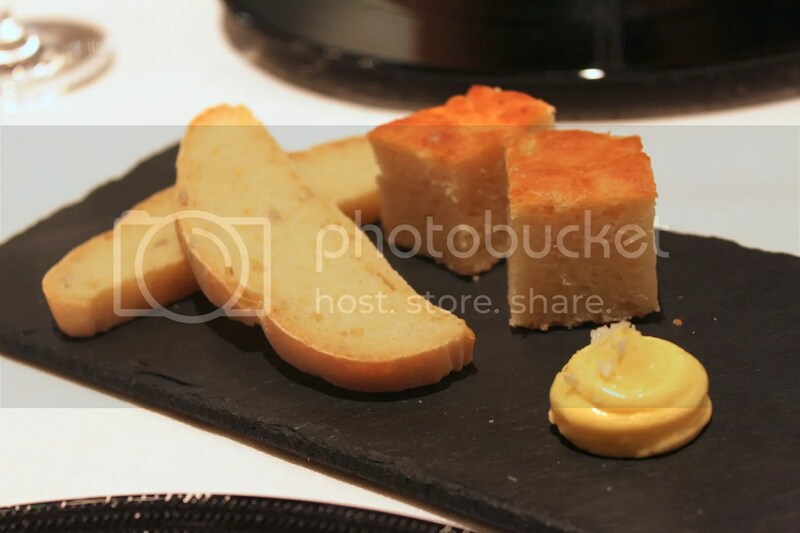 Personally my favourite was the Foie Gras which was really oozing with flavour but I would have preferred it if it was served slightly warmer. 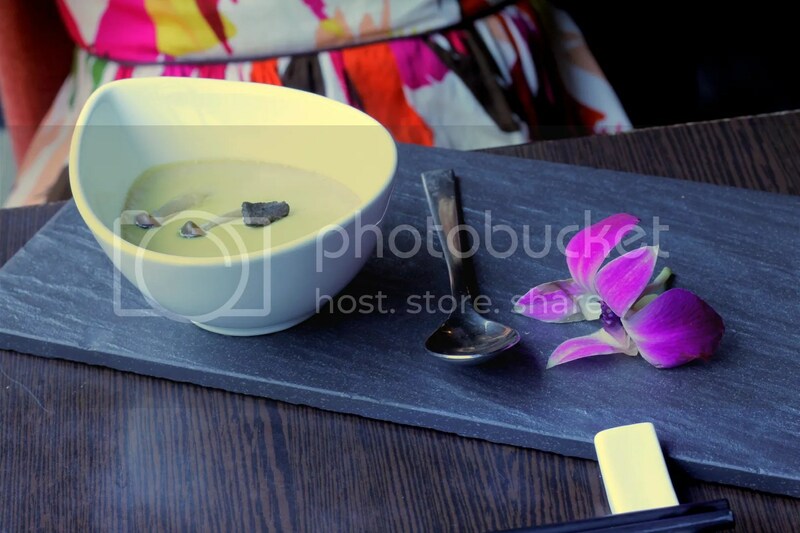 Foie Gras Chawanmushi topped with Black Truffle Slice. While I felt the black truffle slice was totally unnecessary, the subtle infusion of foie gras into the steamed egg added both flavour and smoothness to the chawanmushi. I would highly recommend this! 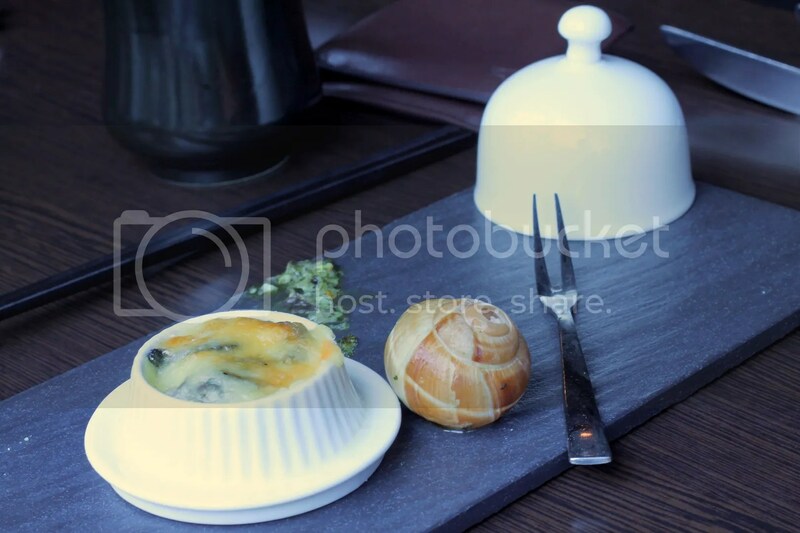 Gratinated Escargots topped with Yuzu Butter. The escargots were cooked in 2 ways, one was grilled with cheese and the other was to be left in its shell and cooked with garlic butter (I didn’t sense the yuzu). I much preferred the latter. 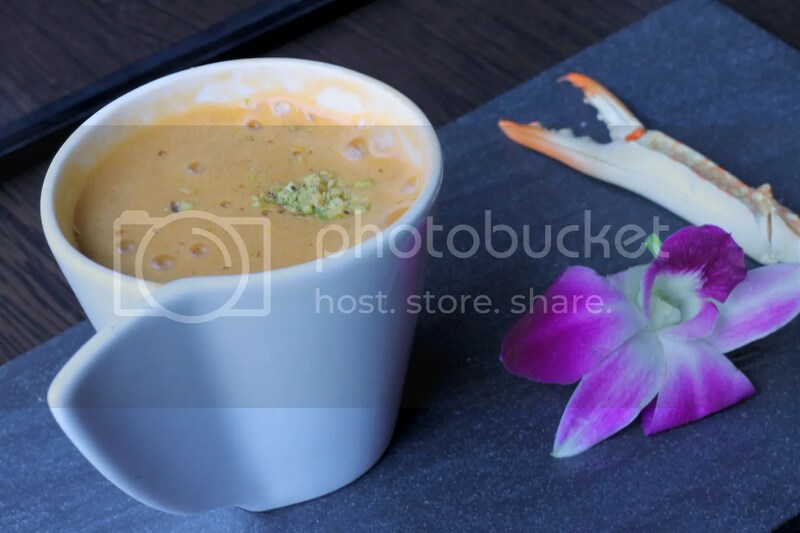 Crab Bisque Cappuccino Style. I dare say this is the best seafood bisque I have ever eaten. It’s just so concentrated and bursting with umami-ness. If the crab bisque is a sprint, then the Double Boiled Beef Consomme would be a marathon. It’s also umami rich but in a more sustainable way that does not overwhelm, leaving you wanting for more. I found a slight Indian influence in the Kurobuta Pork Cheek with Onion Jam, especially with the herbs used to encrust the pork cheeks. Having tried half of Dozo’s mains, I would conclude that this main is currently my favourite by a long shot. 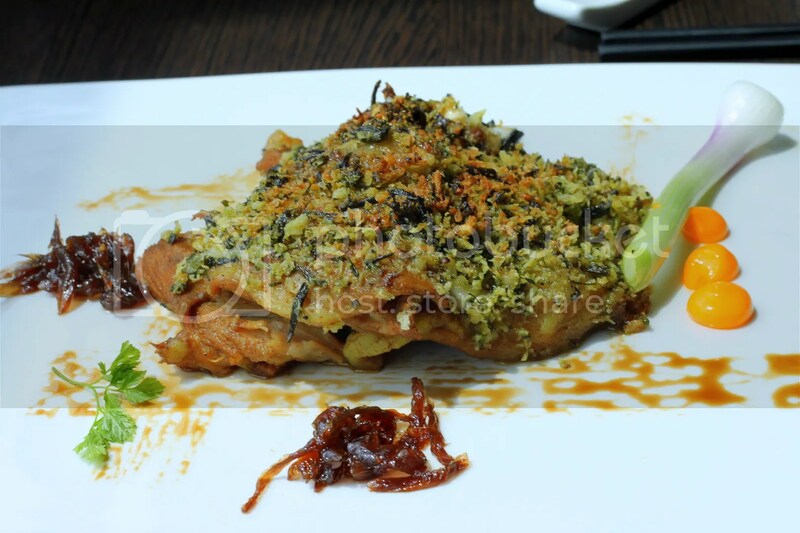 Baked Atlantic Cod Fillet was merely pleasant, dwarfed by the many sensational dishes served. I would suggest being more adventurous in your choice of main when dining here. 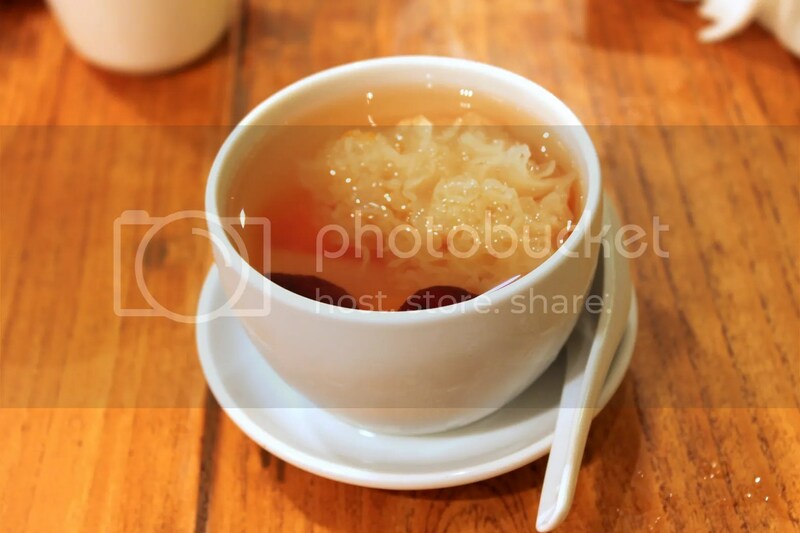 The fruit teas are always what I look forward to when visiting Dozo and its 2 sister restaurants. 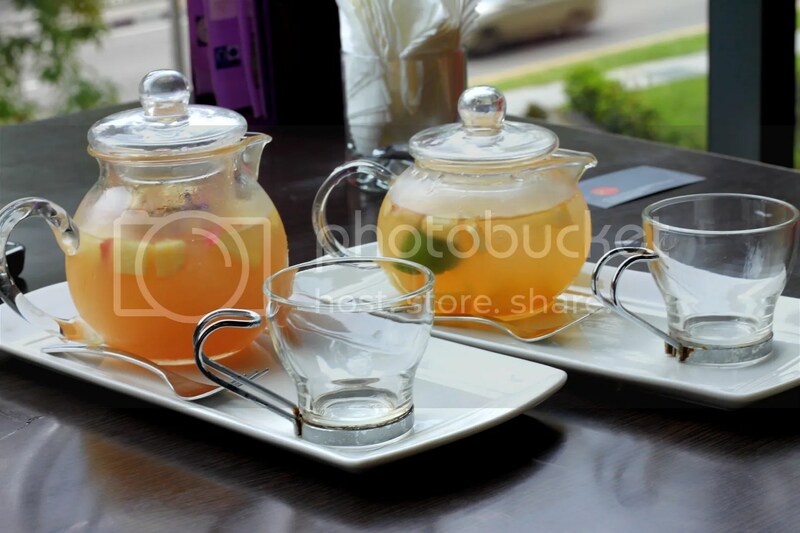 We had the Iced Fruity Refresher & Iced Mellow Apple Melody which are the more popular teas among diners. Sadly, I found it slightly diluted this time compared to my previous encounters with it. French Cream Cheese Cake. It’s on the softer spectrum for a cheesecake, being slightly mousse-like. 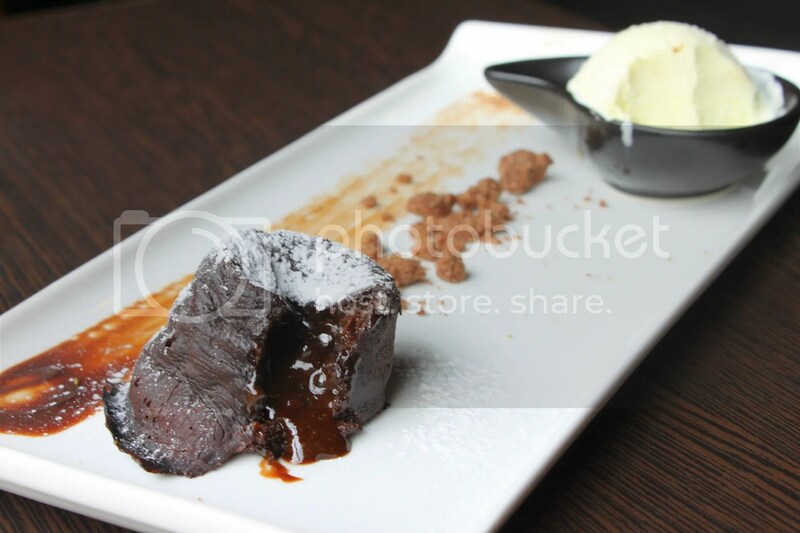 Dozo’s Freshly Baked Warm Chocolate Cake with Ice Cream. 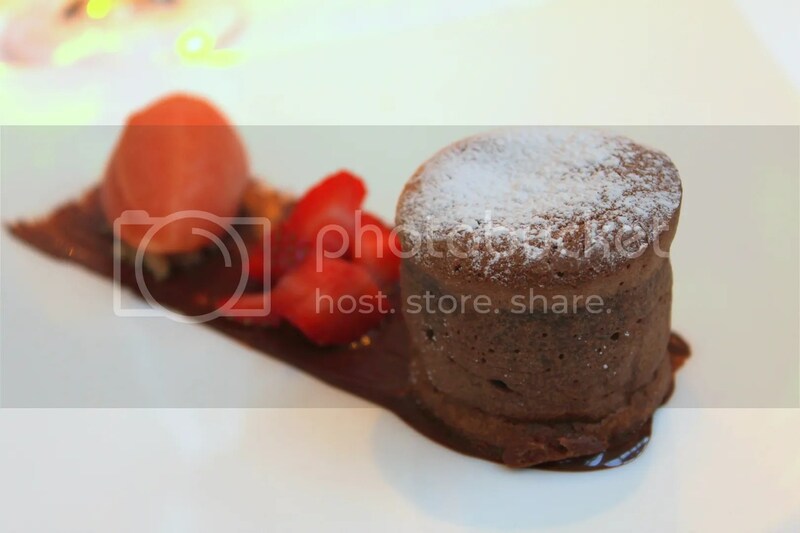 Some chocolate fondants are served moist throughout, but the one served here demonstrates a nice differentiation between the crisp outer layer and molten chocolate core. Very well done. My previous visit to Dozo was to celebrate my birthday but I don’t think it’s possible to visit Dozo only once a year. And oh, did I mention that service was impeccable? By the way, Dozo means “Please, go ahead”. You don’t have to tell me twice. 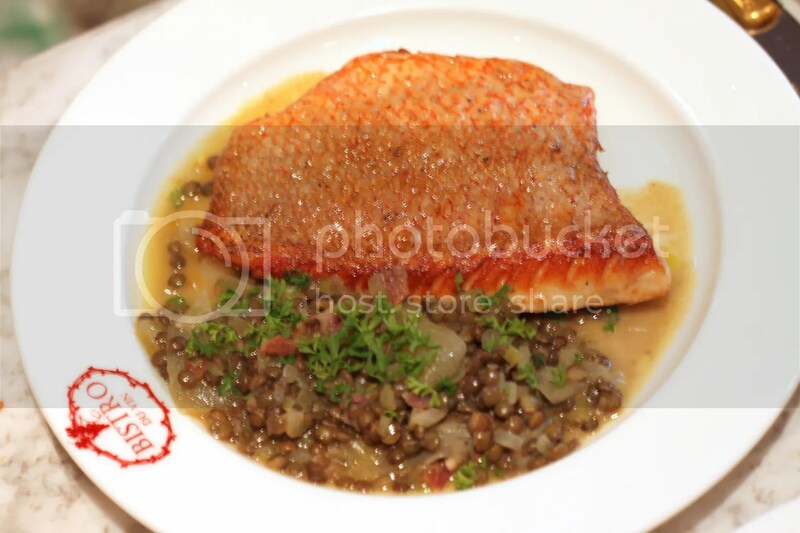 One of Les Amis’s staff came across my previous lunch post on Bistro Du Vin, and left a comment saying that they would look into the aspects of the set lunch I felt could be improved upon. This definitely sets the gold standard for customer service; addressing customer’s feedback outside of their restaurant setting. And it is restaurants like this that deserves a revisit should the 1st visit prove unsatisfactory or have fallen short of expectations. I like the setting of Bistro Du Vin. 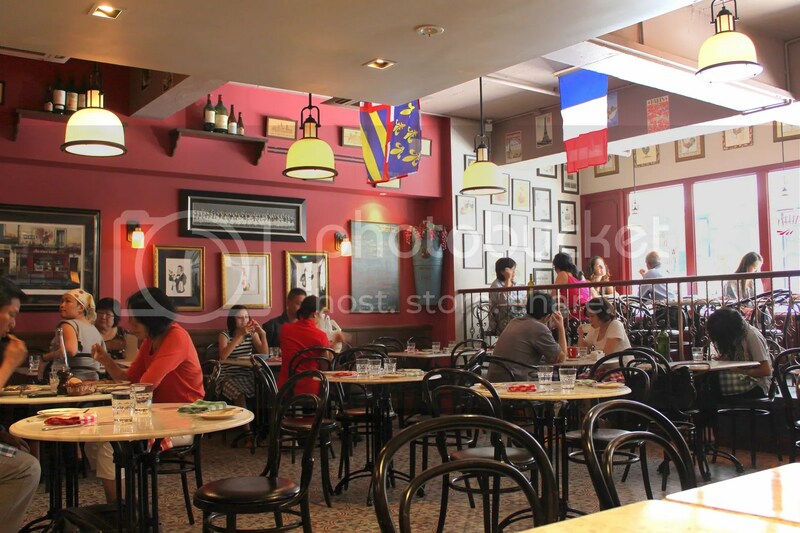 It exudes a Parisian feel that is uncharacteristic of Singapore. Well-heeled tai tais were scarce today, with the crowd consisting mainly of middle-aged women in their casual tank tops. After all, this isn’t fine dining but traditional french fare, where sharing of foods is to be encouraged rather than frowned upon. 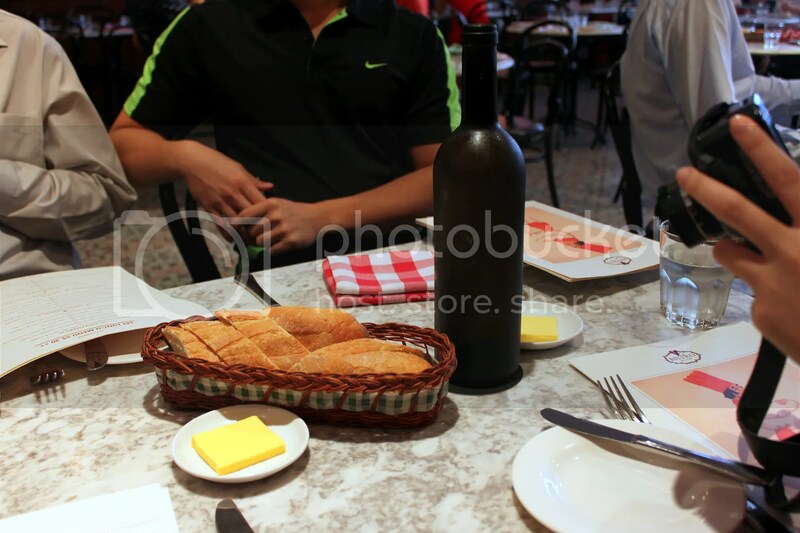 As usual, service was attentive and the staff seemed rather happy going about their business. The complimentary bread came toasty and warm and stood well with me but my bread-discerning friend C commented that the pores of the bread wasn’t large and airy enough. But it’s free bread so 免费多吃! The 3-Course Set Lunches are priced at $30++, though do expect to pay closer to $40++ if you intend to choose some of the more popular course options. 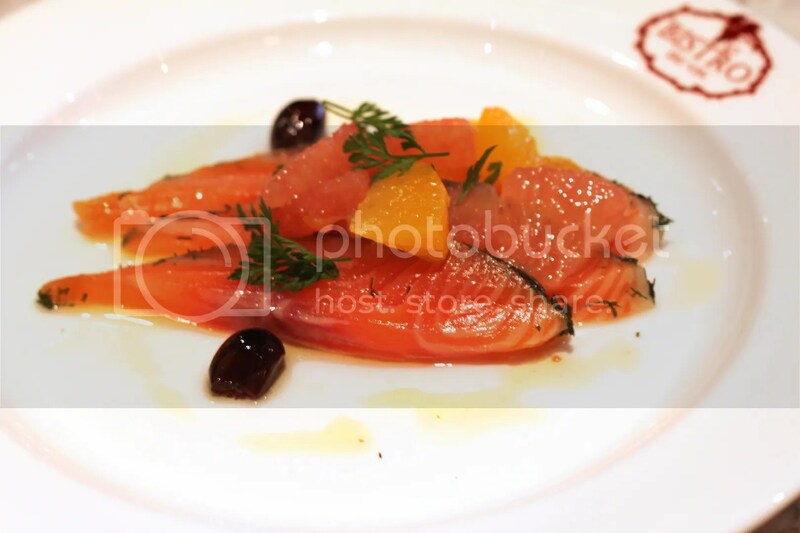 The Salmon Trout Gravadlax with Dill, Citrus & Radish was just a fancy name for smoked salmon. Not as salty as pre-packed supermarket versions and so, there wasn’t any problems eating it straight up. French Garlic Sausage & Celeraic Remoulade on Toast. Pan-Fried Foie Gras with Prune Compote (supplement of $6). It came as a really large slab, probably the largest I have come across in any set lunch. However, it was throughly drenched in oil, similar in fashion as my previous visit. The problem with the residual oil is that it sticks to the throat which is really irritating. I also felt that the searing could have been executed better. Personally, I think that Ember’s Mirin Foie Gras is the benchmark to beat right now, and rumour has it that Gunther’s Candied Almond Foie Gras ($40) is something to watch out for as well, but at $40 (when Gunther’s set lunch is $38), it’s quite a hard pill to swallow. 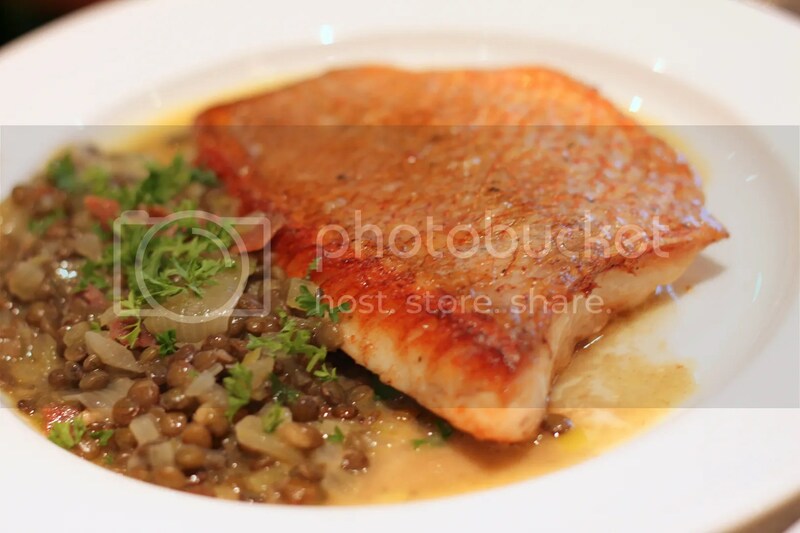 Pan-Fried Red Snapper with Lentils Vinaigrette. 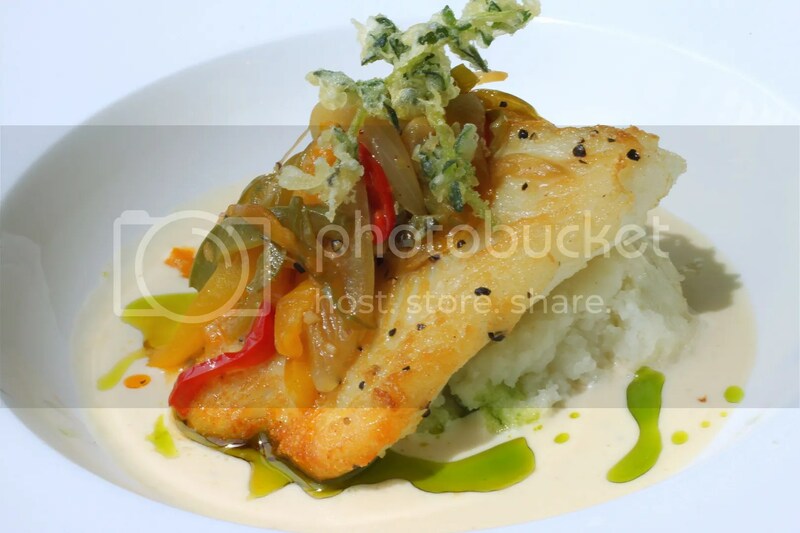 I have had quite a few bad experiences with Red Snapper as unlike Cod , it’s a pretty lean fish and so, there’s a lot of room for error, especially if the flesh isn’t seasoned well or overcooked. 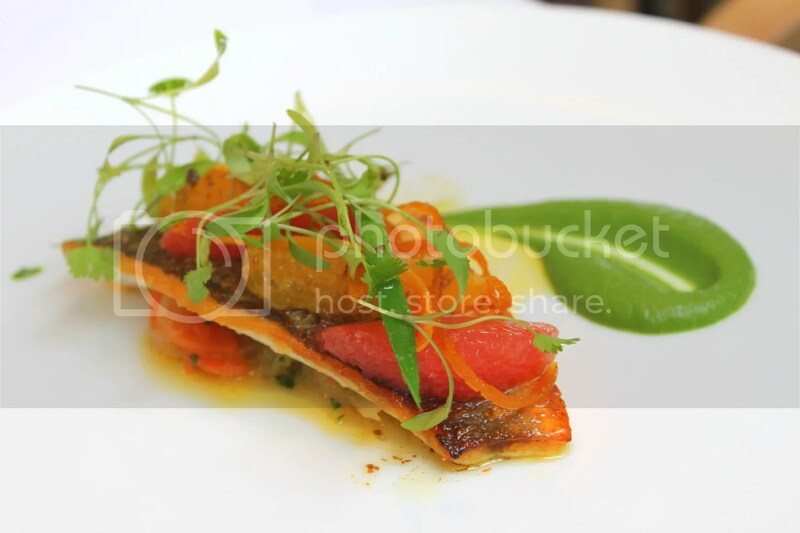 But the Red Snapper here deserves commendation. The fish is fresh and the fish skin is fried to a nice crisp. Braised Pork Belly with Lingot Bean Stew. 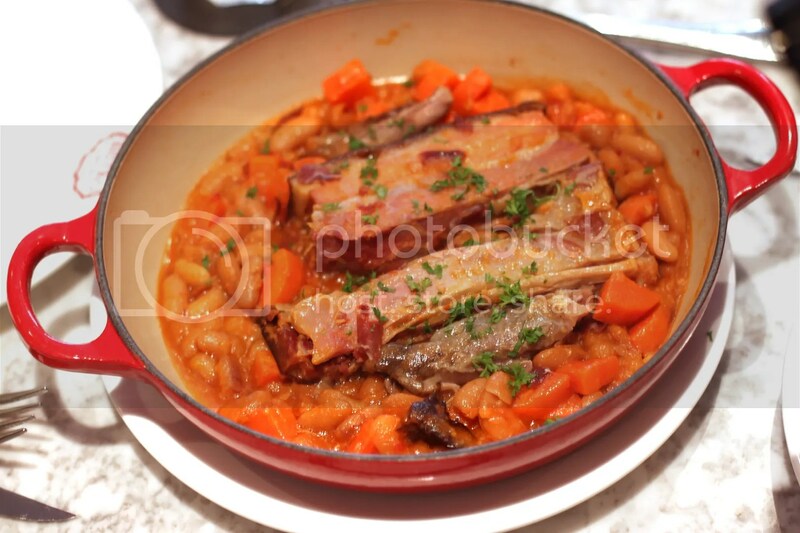 I liked the succulent belly pork with its hearty bean and carrot stew. Normally, I would suggest sharing a pot of pork belly but surprisingly, it wasn’t cloying as I had expected it to be and I could have easily polished it off on my own. French Duck Leg Confit served with Croucroute (supplement of $3, but chef waived it because he deemed the size of the duck leg smaller than usual. A pleasant surprise when the bill came). The duck confit was well done, with the meat left juicy and moist. 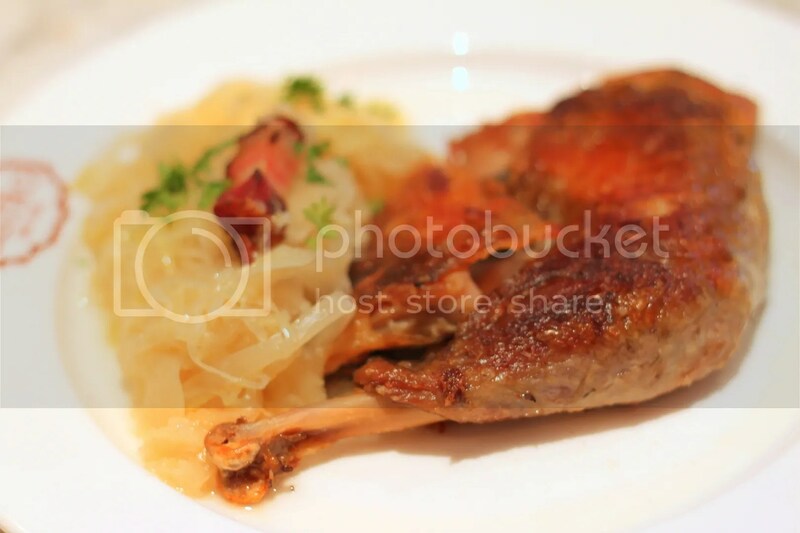 Guinea Fowl Confit served with Choucroute. 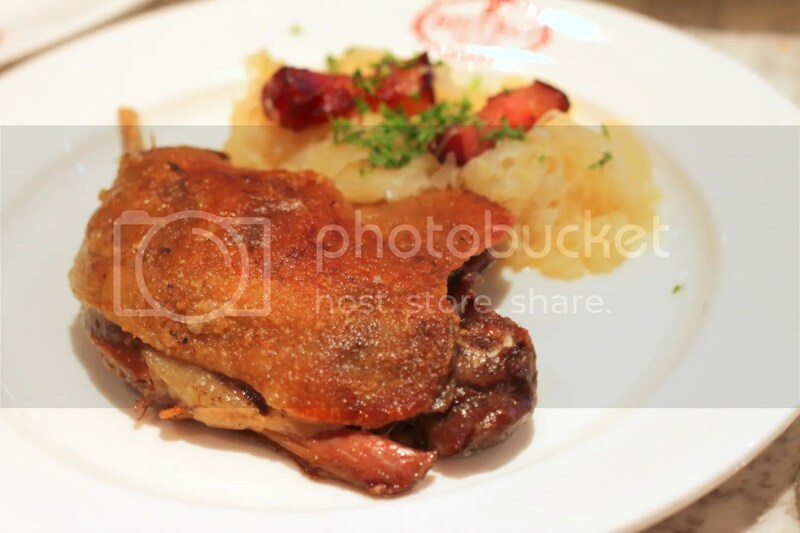 While it looks similar to the duck confit, I much prefer the duck. 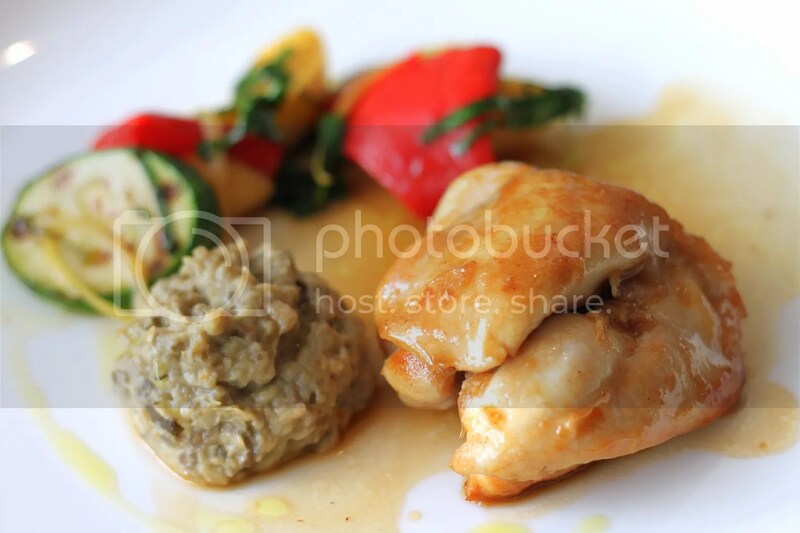 Guinea Fowl tastes much like chicken, though with a drier and less fatty texture which I find less delectable. 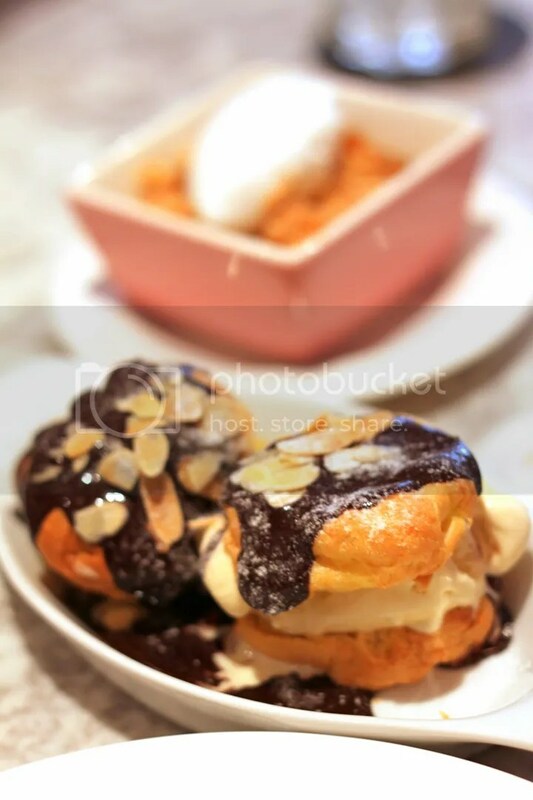 Profiteroles (supplement of $3) are definitely crowd pleasers. I find the ones here adequate, though a notch down from the ones at Au Petit Salut. 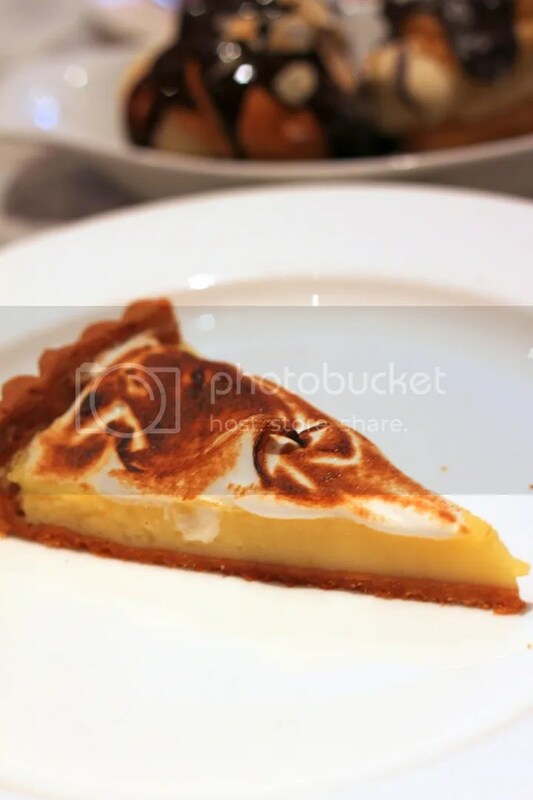 The Lemon Meringue Tart was a little too sour for my palate and the tart base could definitely be improved upon. 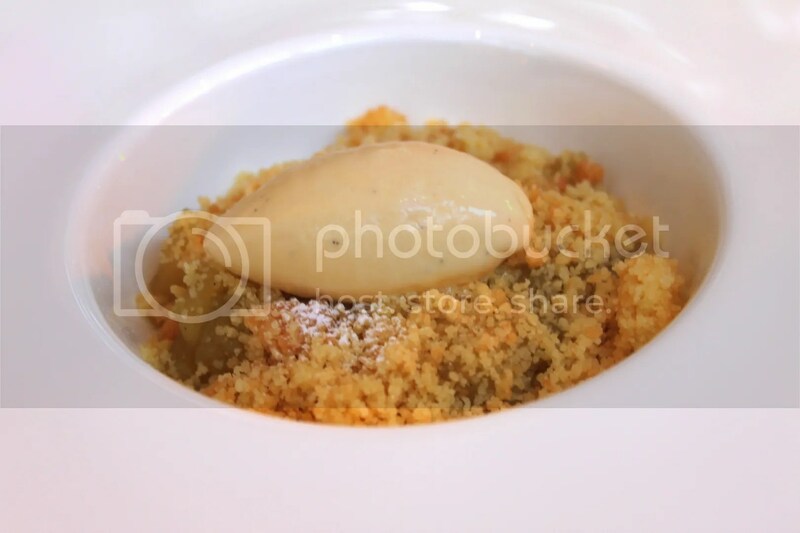 The Banana Crumble with Coconut Ice Cream is an interesting dessert. The caramelized bananas being a suitable companion to the coconut ice cream. Creme Brulee was pretty average. I had a much more enjoyable meal compared to my first visit. Hopefully the 3rd one proves even more so. 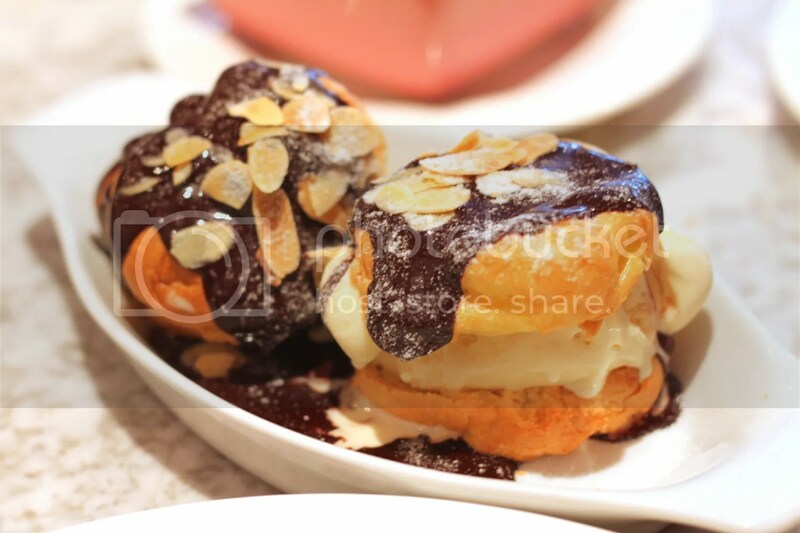 Categories : All YumYums in my TumTum, Cuisine Type YumYums, French, Location of YumYum, Orchard, Yummy! 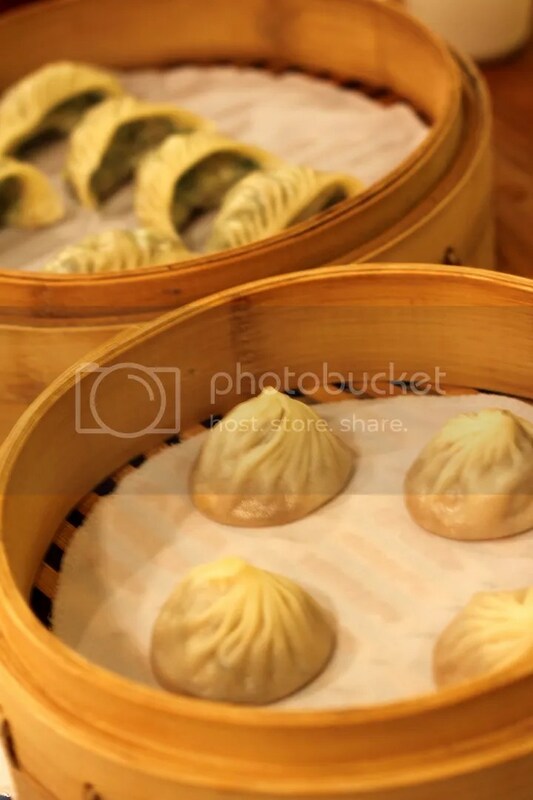 Originating in Taiwan originally, Din Tai Fung has since expanded around the world and was awarded a Michelin 1 Star in Hong Kong’s 2010 Michelin Guide. 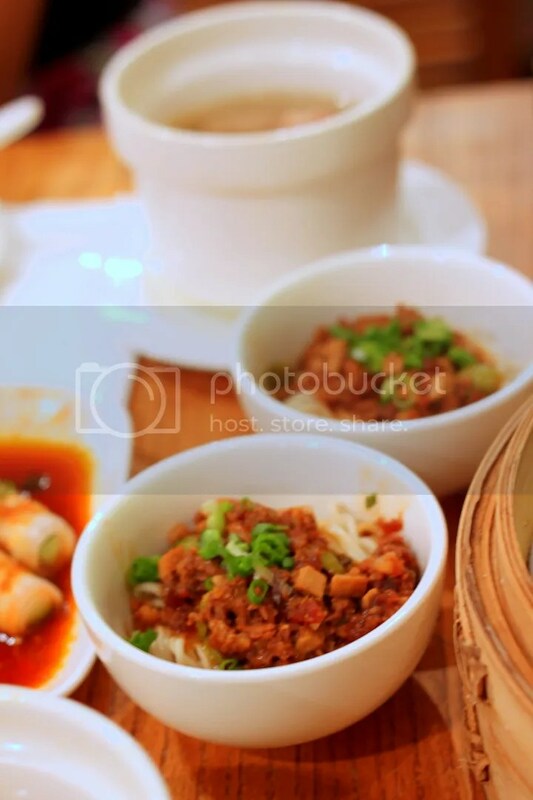 It’s secret to success…no doubt their renowned Xiao Long Baos. The Din Tai Fung branches found in Singapore is franchised by the Breadtalk Group (who is also responsible for franchising Carl’s Junior and Ramenplay, in addition to owning Toastbox, Bread Society and Food Republic), and the chefs here are apparently required to undergo a 9-month vigorous training program in Taiwan to ensure that standards of the franchisees remain on par with the Taiwan and Hong Kong branches. 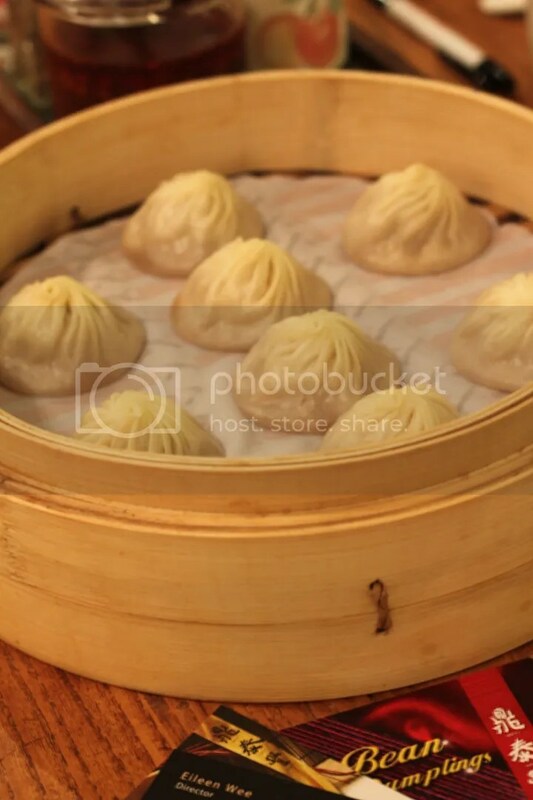 With regards to their Xiao Long Baos, strict guidelines have been set such that the xiao long bao skins must be within 5.8g to 6.2g and there must be 18 folds on each xiao long bao. 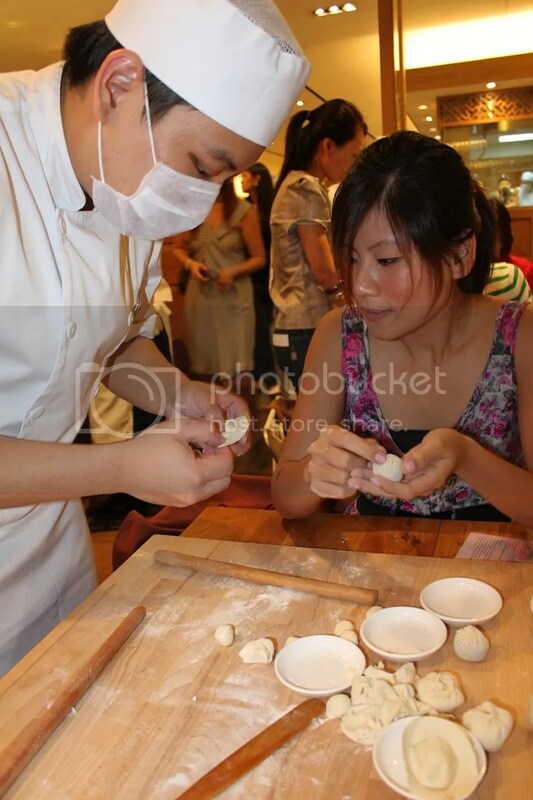 We were first given a demonstration with explanation on the ingredients used to make the Xiao Long Baos and how to fold the 18 folds. After which, we were treated to high tea, a 10-course one at that! 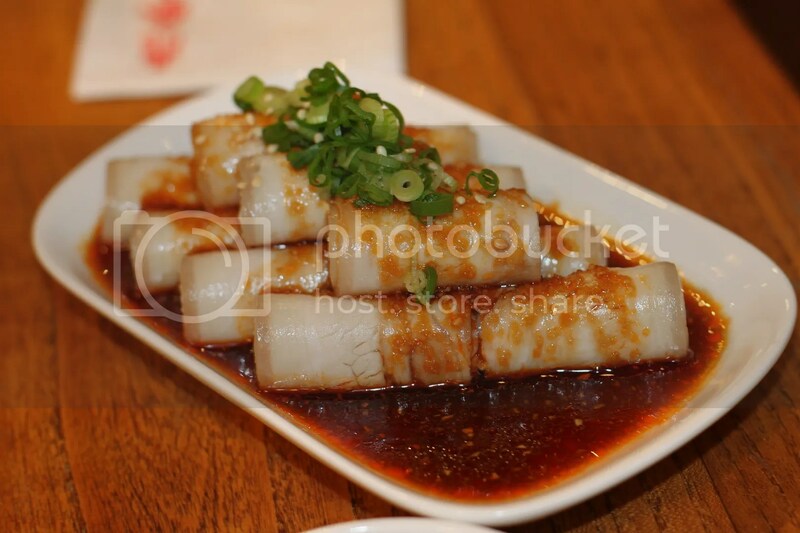 Cucumber wrapped in Pork Belly in Chili Oil. The Caucasian lady sitting on my table mentioned that this was her son’s favourite dish at Din Tai Fung. 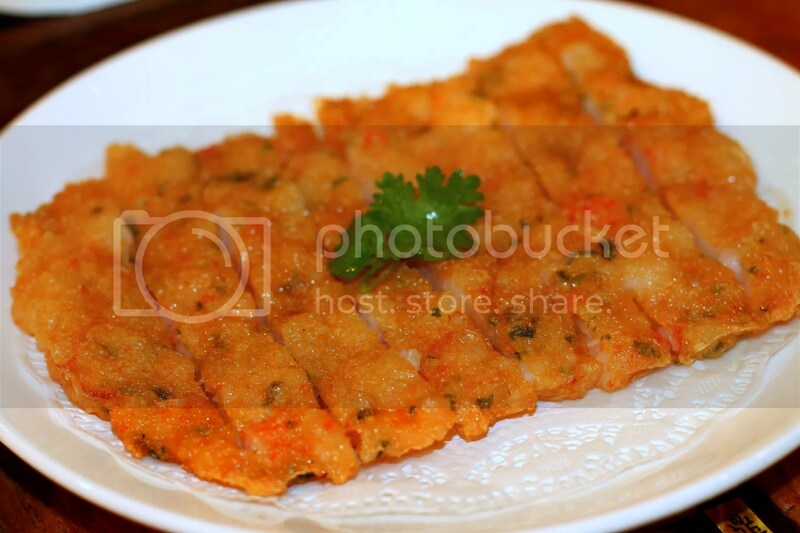 It’s not difficult to see why with the generous stuffing of springy shrimps in this dim sum inspired Shrimp Pancake. 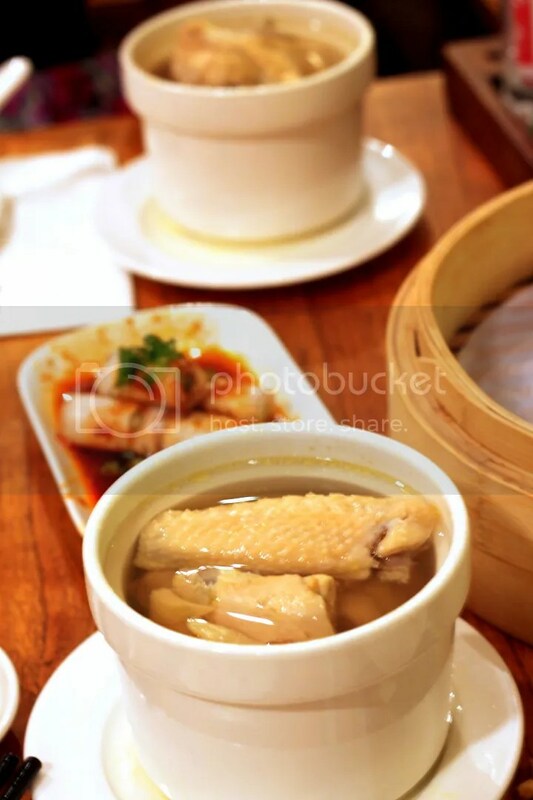 Din Tai Fung is also famous for their Ginseng Chicken Soup which packs some umami flavour though I still think that it lacks the appeal of a home-made soup showered with motherly love. Xiao Long Baos here are definitely competent but there are competitors around whom I actually prefer. They are Swee Choon Dim Sum Restaurant and Hand in Hand Beijing Restaurant, both located along Jalan Besar. The Black Truffle Xiao Long Bao is only available at 2 Din Tai Fung outlets in Singapore (Paragon and 1 other outlet which I can’t recall now). I’m not sure if something is wrong with me but truffles don’t appeal to me much, so I’d much prefer the original Pork Xiao Long Baos which doesn’t come with such an earthly taste. On the other hand, the Caucasian women sitting next to me were deeply enamoured by the robust flavours bursting from the truffle xlb. To each his own I guess. 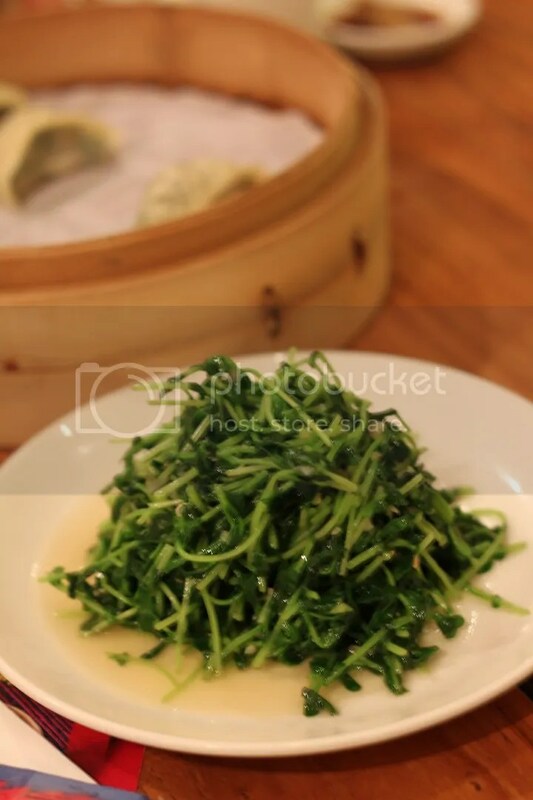 Pea Shoots stir fried with Sunflower Oil. Snow Fungus with Red Dates and Papaya. This is the first culinary workshop I have attended and I have to say it’s really good fun. On a side note, Din Tai Fung will also be flying in Red Bean Rice Dumplings from Taiwan in celebration of the Dragon Boat Festival. 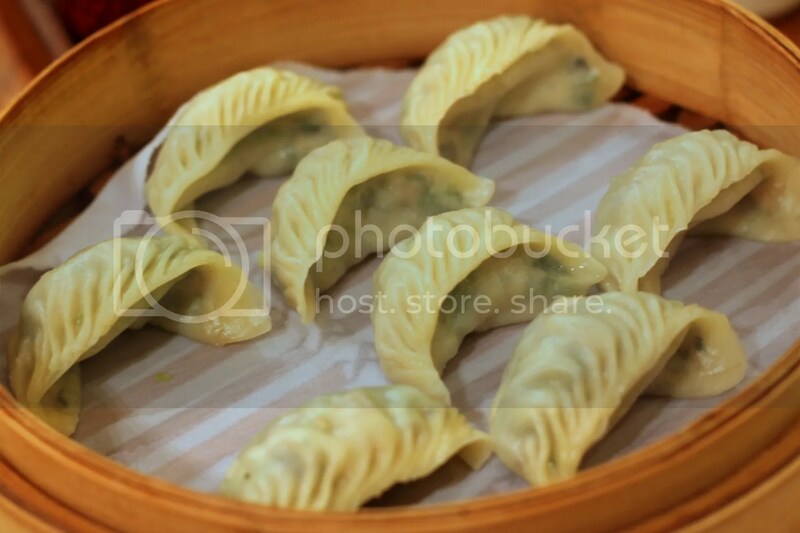 It will be sold at $4 per dumpling from 9 May to 6th June 2011, and DBS/POSB Card holders will enjoy a complimentary dumpling with minimum spending of $50. 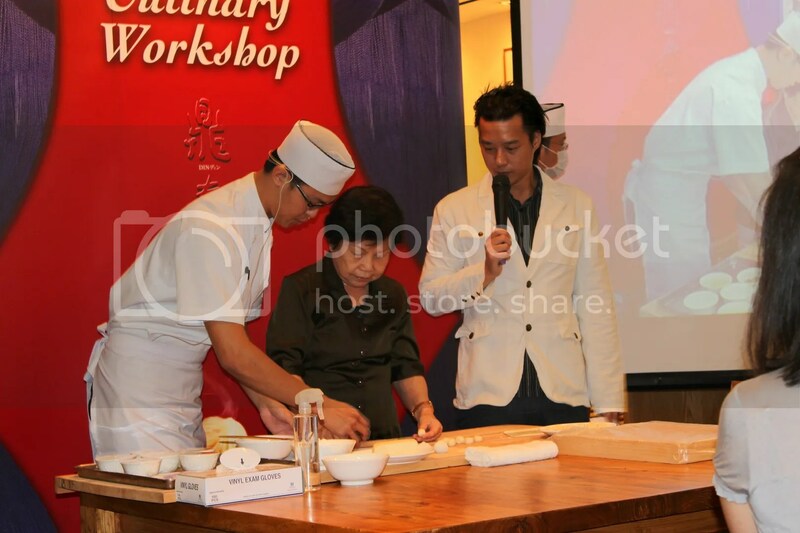 A very special thanks to Din Tai Fung for the invitation. 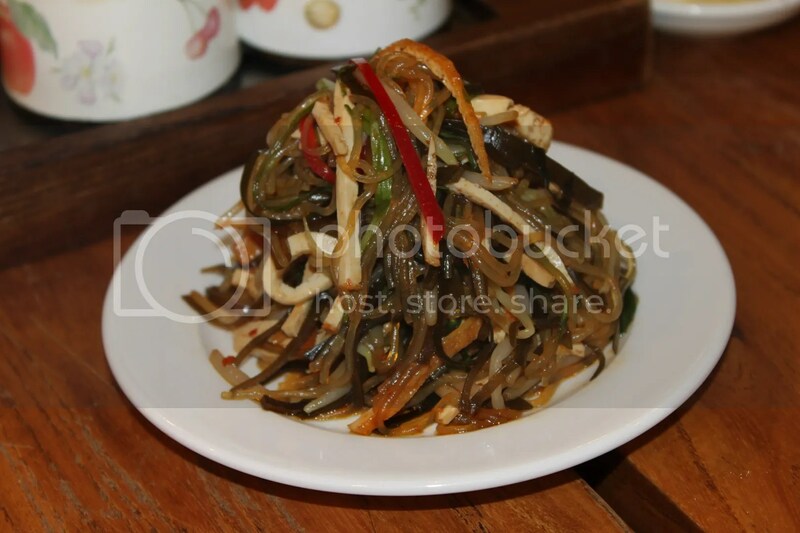 Categories : All YumYums in my TumTum, Chinese, Cuisine Type YumYums, Invited Tasting, Location of YumYum, Orchard, Workshops, Yummy!